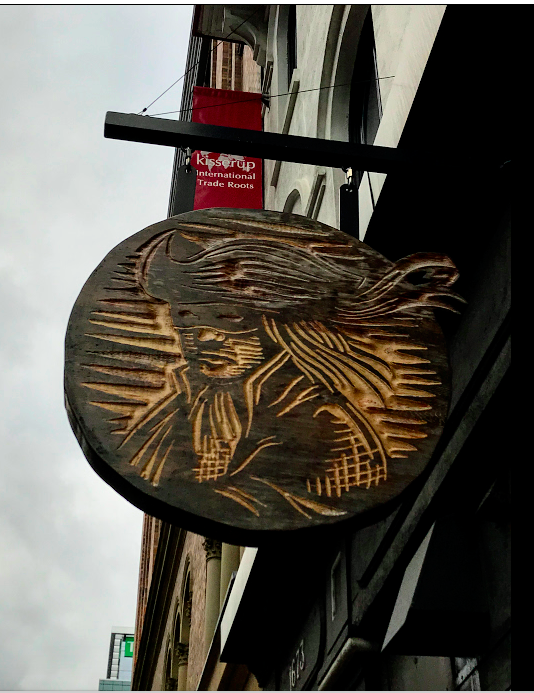 For those of you who follow me on Twitter, you will have seen some of these photos as I often tweet out my “Best Flaneur Finds” when I get home from a day of wandering. Sometimes it is just one photo, sometimes as many as four. 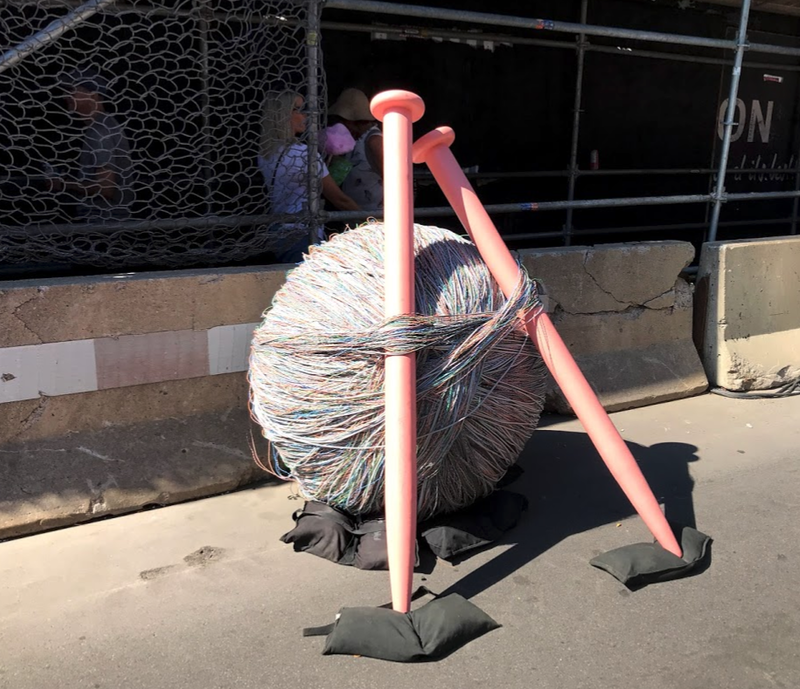 I thought it would be fun to collect some of the best “Flaneur Finds” of 2018 in a blog and share with those who aren’t on Twitter. This huge rubric cube (sorry it isn’t functional, that would be very cool) in Calgary’s Beltline is a fun surprise to those driving and walking by. 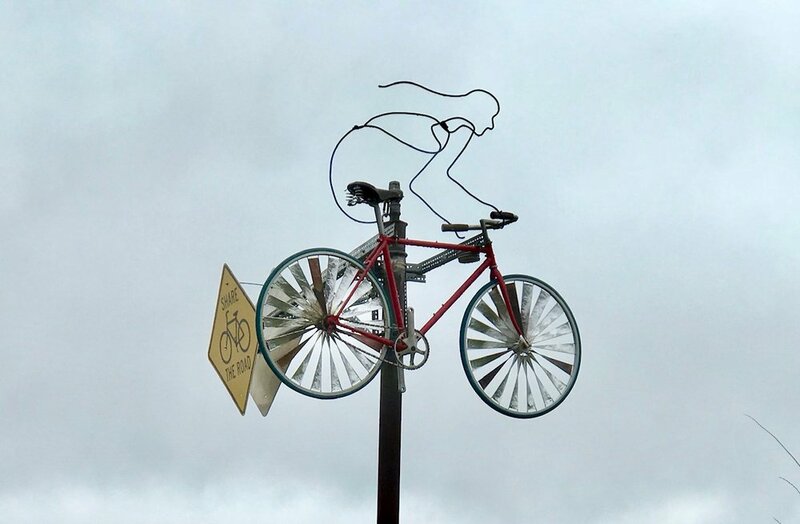 I love public art that is fun, clever and in unexpected places…more of this please in 2019! Calgary’s +15 indoor walkway was full of art, it is Canada’s most unique public art gallery. 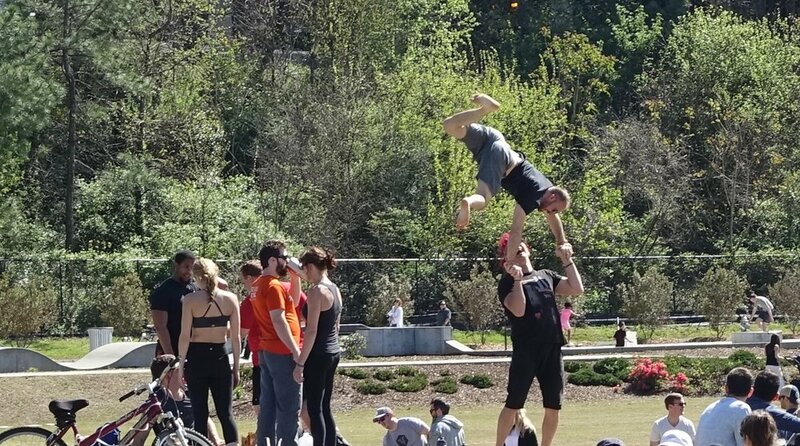 Loved this whirly-gig artwork along Atlanta’s Beltline multi-use pathway. Love to see more of this in 2019! Further along Atlanta’s Beltline I found this banner on a construction site. Love to see more of this at construction sites….simple to do and thoughtful! This mirrored cash machine on the plaza outside an Atlanta office building is a stroke of genius. It became an ever changing sculpture that animated the plaza is a way a static sculpture could never do. Why don’t we see more of this? 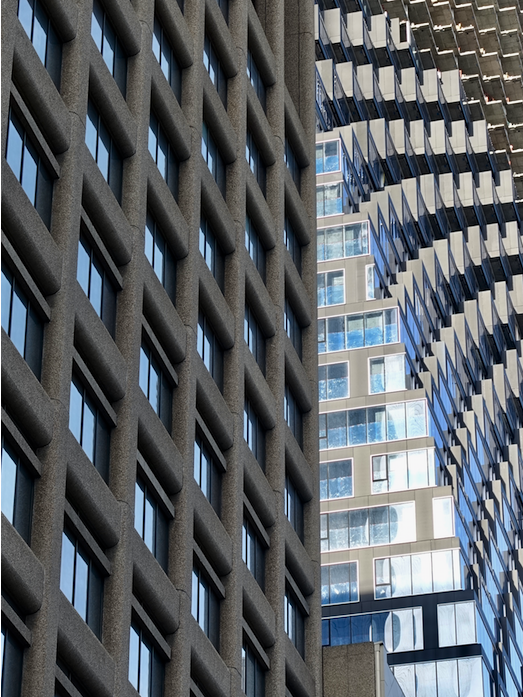 Downtown Calgary’s architecture is full of intriguing patterns, textures and juxtaposition. Remember to always look up! The patina and words on this door in Hamilton harkens back to a different time. 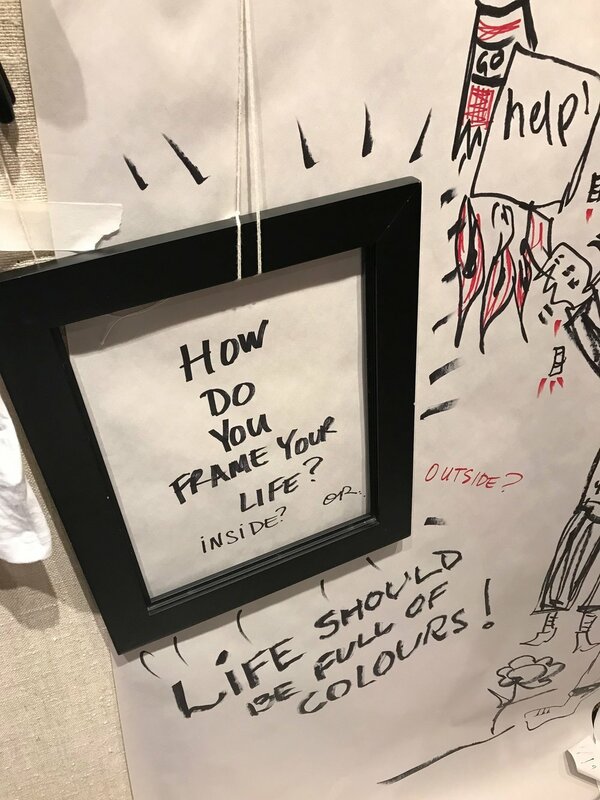 A free philosophy lesson in Saskatoon’s downtown warehouse district. 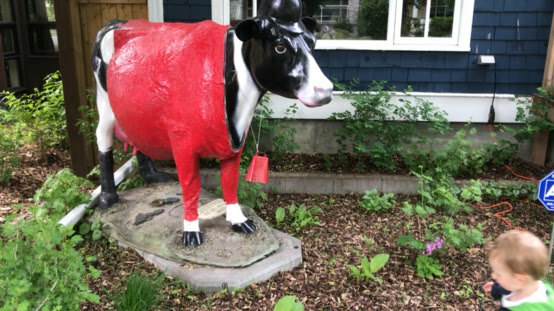 Found this friendly, front yard in Calgary’s Parkdale community. Love the free Little Libraries I find everywhere I go. I hope the addition of front yard seating will also catch on. 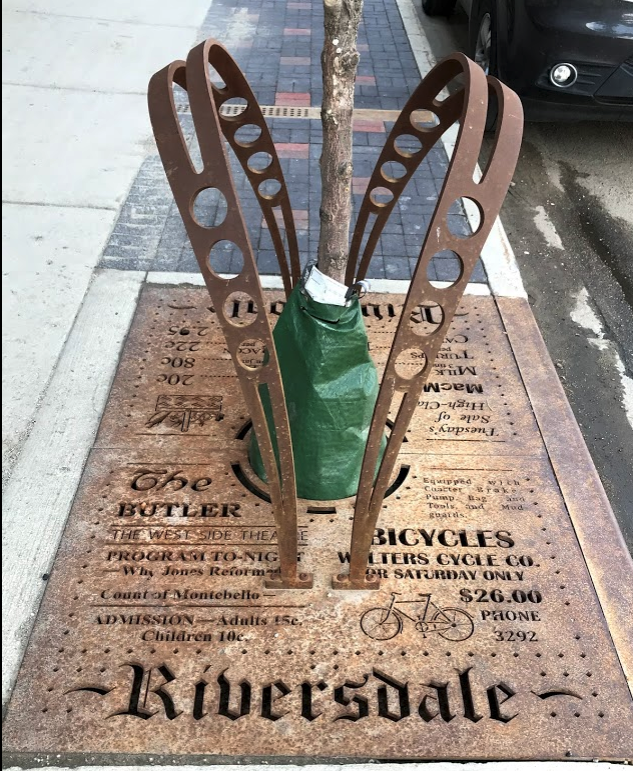 How pedestrian friendly is this? Love this play on the term “couch potato” by Regina artist, Victor Cicansky in the window at the Glenbow in downtown Calgary. It had a personal meaning for me as I have small Cicansky piece of a chair with a potato in our collection. I must get to the Glenbow more in 2019! By chance I looked out the window of my financial advisor’s office in downtown Calgary and saw this amazing view of the sky-light of The Core shopping centre. It is the longest point supported structural skylight in the world. Not sure exactly what that means, but it is impressive inside and out. Remember to always look out the window in 2019! Speaking of windows, I love the giant abstract / surrealistic art created by the reflections in glass facades of contemporary office towers every time I wander downtown. They are like giant Dali paintings. Found this little guy while golfing at Redwood Meadows. Yes golfing can be a flaneuring activity. Went to explore a rock garden, found a cemetery and then this. Almost side by side were two similar graves one with my surname and one with that of our next door neighbour who we are very close to. Yikes…. Found this carnival mask in the quaint Kensington Hardware store. One of the great things about flaneuring is find fun things in the strangest places. 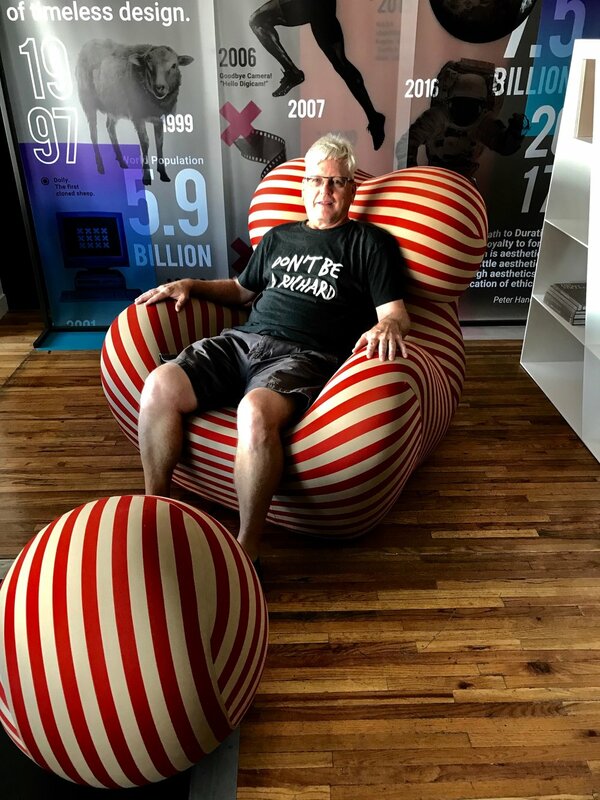 While wandering Inglewood’s funky Main Street I found this fun chair. Ironically, I have been looking for a Netflix binging chair for over a year. I didn’t have the balls to buy it! 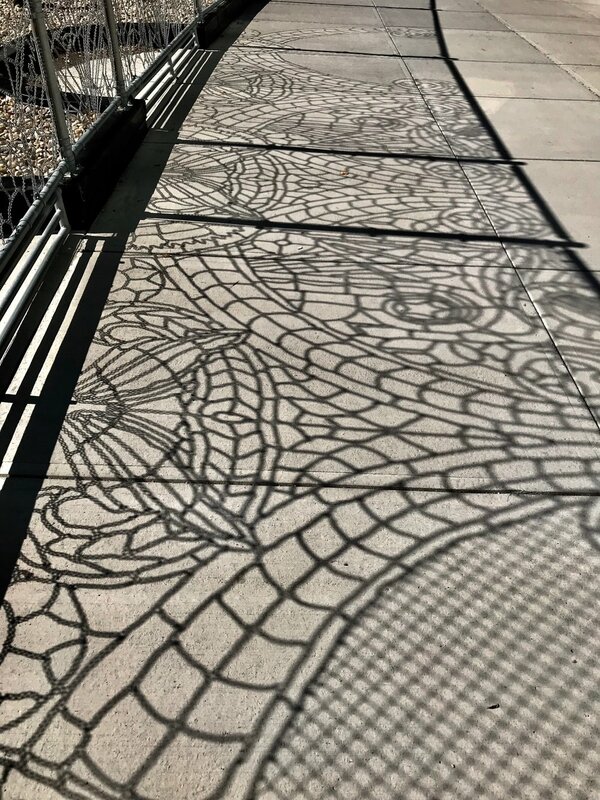 Found this strange shadow sidewalk art in downtown Calgary across from the Bow office tower. It is created by the ornamental chain-linked fence that surrounds a future building site. Kudos to the developer (I expect with some push from the City) to create something more ornamental vs ordinary. More of this in 2019 please! Was wandering Hamilton’s City Centre when this guy rides his bike up on the sidewalk behind me and says “what are you doing?” I was taking photo of house with a funky porch. Turns out it was his sister’s place. We chatted about flaneuring and then I noticed his rings. I asked if I could take a photo of him and his rings and he was happy to oblige. 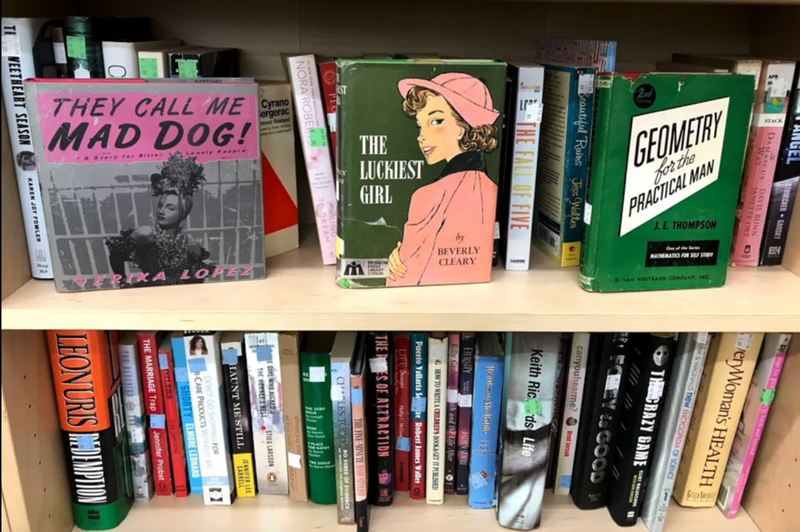 I love flaneuring the books at thrift stores as you find the most amazing juxtaposition of ideas, images and ideologies - like this one in Saskatoon. Found this while flaneuring in Halifax. 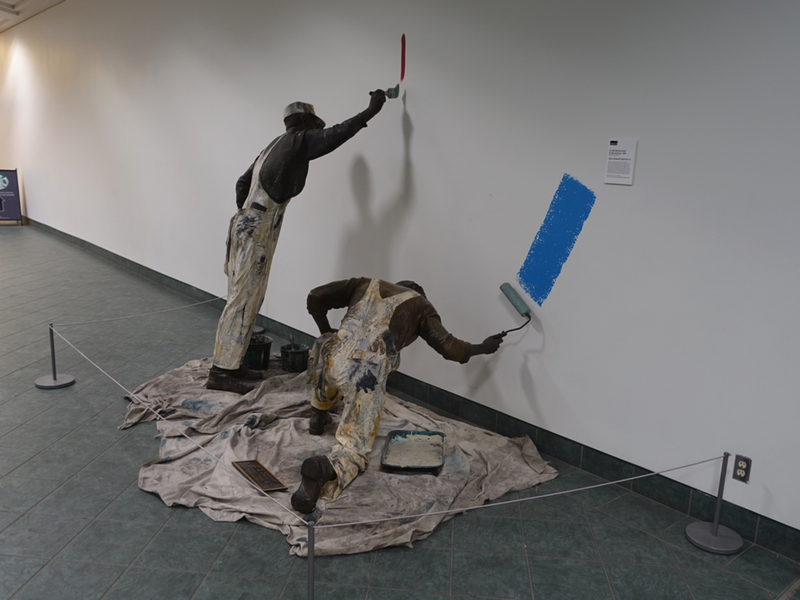 It was in the gallery space of the Provincial Archives building and struck a cord with me as I love colour. Ironically the text and fame are black except for the word “outside?” Is this the artist’s subtle statement? Flaneuring can be thought provoking. Another provocative flaneur find from Calgary’s Inglewood community. I have probably wander this street a dozen or more times and never noticed this small 1918 church with its tiny plaque above the door. The quote says, “Lift up a standard for the people.” Isa 62:10. with two soldier-like figures trying to plant a flag with waves crashing around them. Enough said? 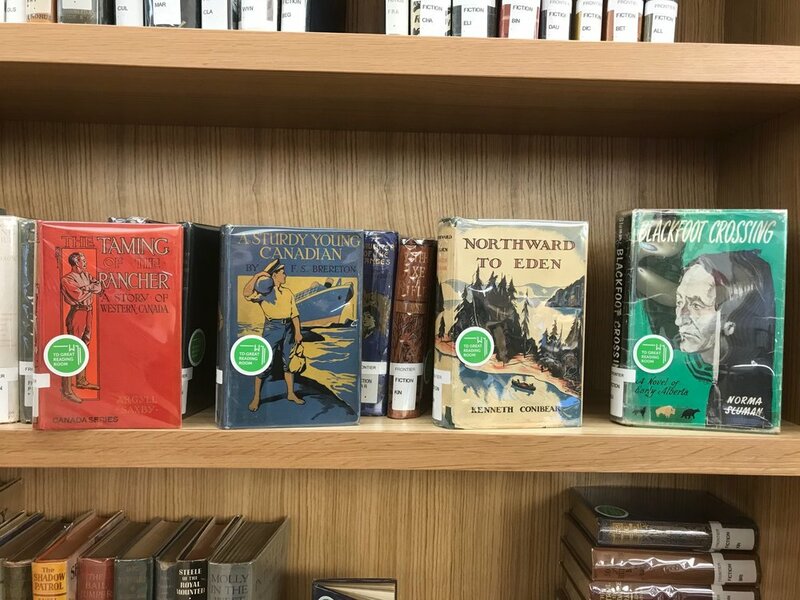 Another book shelf find, this time at the new Central Library in downtown Calgary. This would make for an interesting 2019 reading project. 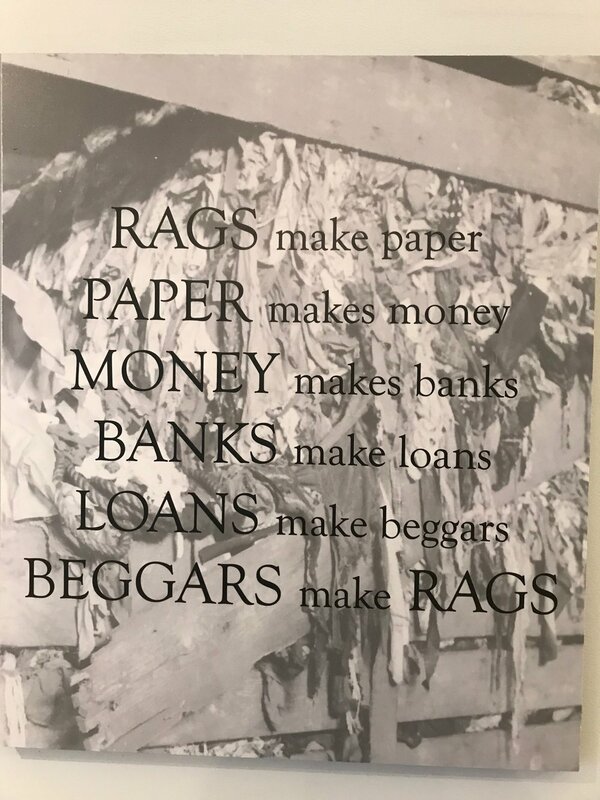 Found this in a display case at the Robert C. Williams Museum of Papermaking, on the campus of the Georgia Tech in Atlanta. If you are in Atlanta, the museum is definitely worth a visit. If you haven’t tried flaneuring, I would encourage you to do so in 2019. 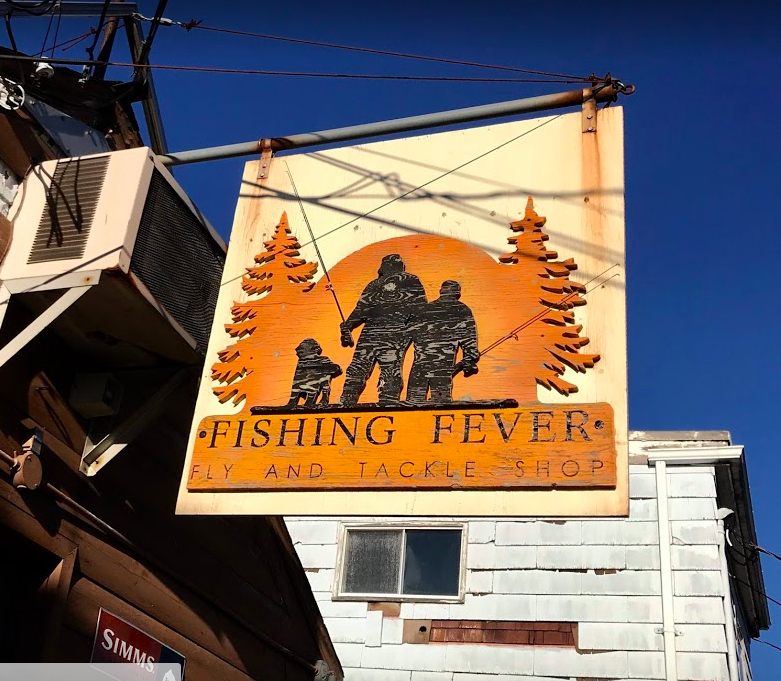 Ever since I watched the documentary “Finding Vivian Maier” on Netflix early this year, I have become more intrigued by the connection between being a flaneur, being an everyday tourist and being a street photographer. As an experiment I recently collected some of my street photographs from 2018 and a few from earlier years and started comparing them with Maier’s side-by-side. I was surprised to see how many times we had taken photos of similar subjects. While all of my work is in colour, most of her’s is in black and white. I debated converting my photos to black and white so the comparison would be more apples to apples, but decided not to as my work has always been about colour. However, there is one photo comparison at the end where both are black and white as I found a black and white photo I had taken that by chance echoed hers. 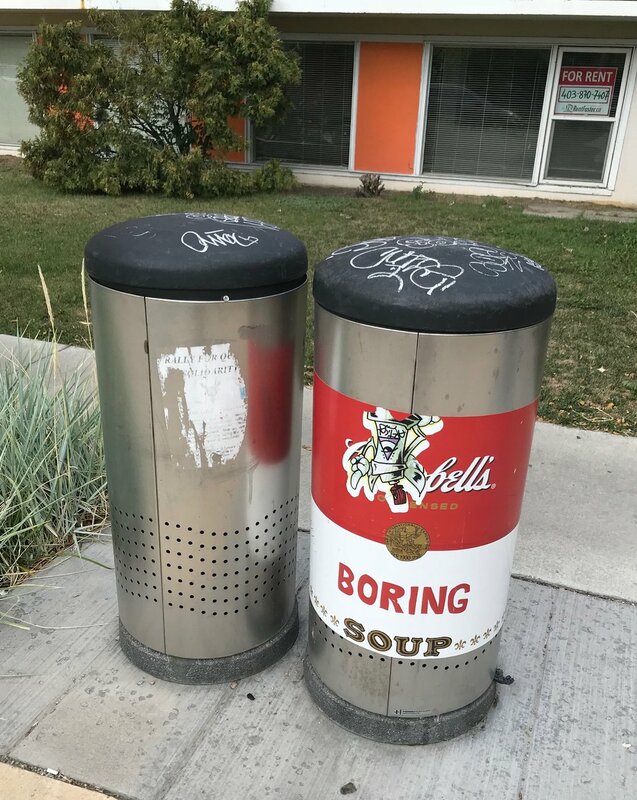 Ironically they are both self-portraits. It is interesting to compare and contrast the different perspectives, often Maier is closer too the people in the street, while I like to stand back. It is also interesting to compare how the street life has changed over the past 60+ years. It is hard to find a street photo today where there isn’t somebody with a cell phone. 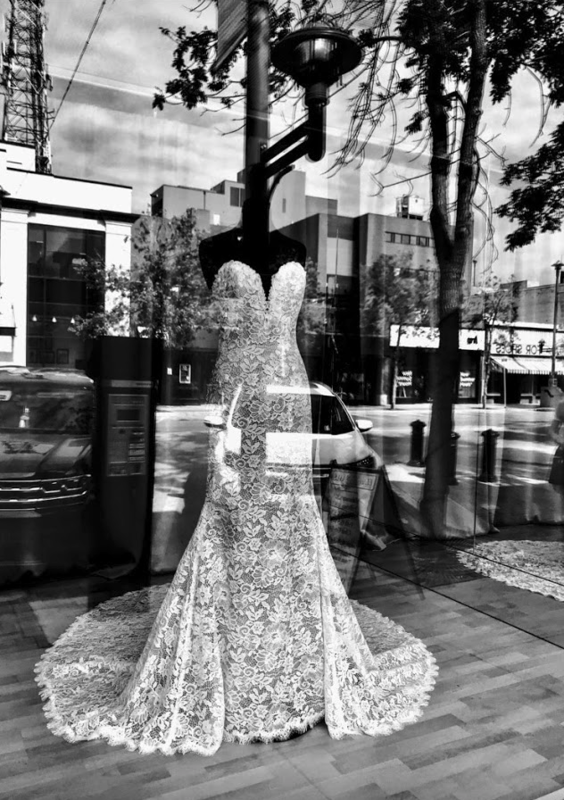 This blog is in no way an attempt to suggest my photography is on par with Maier’s, but rather a personal experiment I wanted to document and share for feedback. 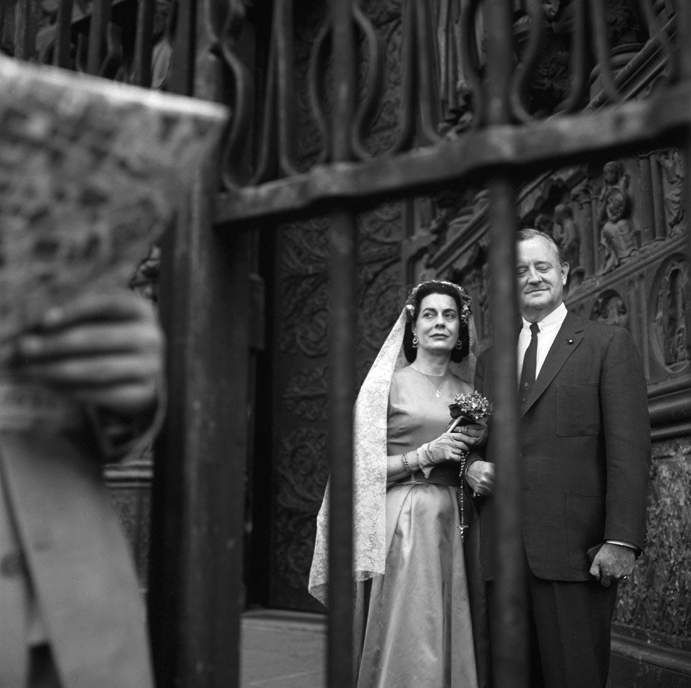 I hope you enjoyed the cyber exhibition “Vivian Maier vs the Everyday Tourist” and will comment as you see fit. Note: All of the Maier photos in this blog are screen shots taken from the Vivian Maier website which is worth exploring if you want to see more of her work. 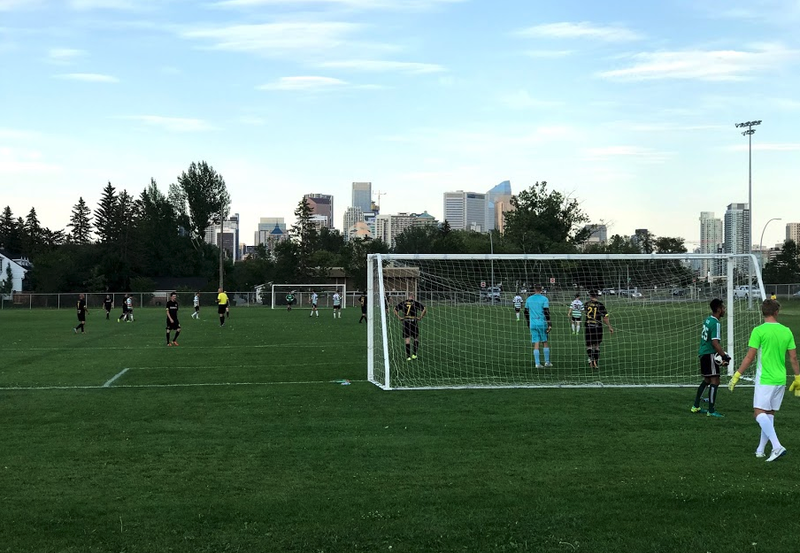 Jan Morris: Edmonton A Six-Day Week? Never visit Edmonton in the winter! Today Edmonton celebrates its long cold winters with its ice sculpture festival in Hawrelak Park. Today, Morris could have used Uber instead of renting a car to get there. I am sure she would be impressed with how Edmonton has evolved since the early ‘90s. Jan Morris, born in 1926, is a Welsh historian, author and travel writer who has written extensively about cities around the world since the ‘60s. She has an amazing ability to observe, ask questions and articulate her thoughts on the underlying character of a city – good, bad and ugly. 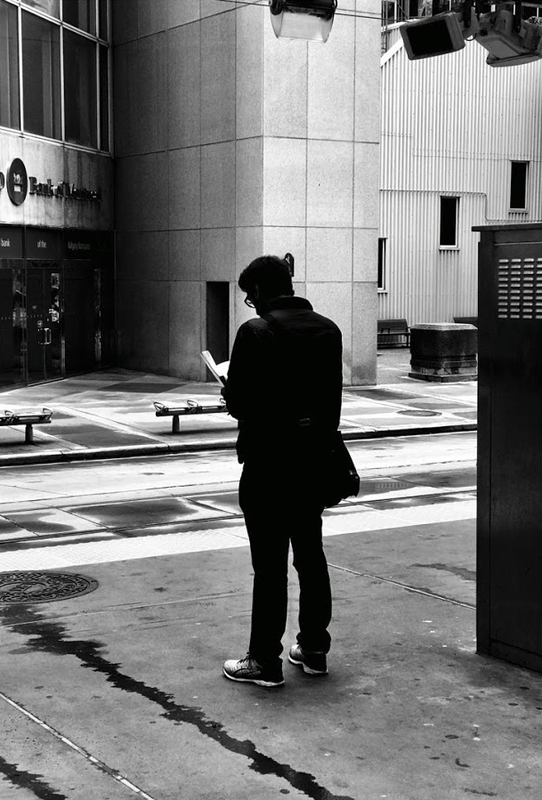 These are not fluffy travelogues, but urban character studies. She first visited Canada in the early 1950s, getting to know its cities and its people better than many Canadians ever do. The series of essays on Canadian cities in her book “City To City” were commissioned for Saturday Night magazine. Her comments about Canada and Canadian cities are often not very flattering and sometimes I wonder how, in such a relative short visit, she can feel so confident about her ability to capture the pulse and sense of place of a city accurately. This is from Edmonton’s Downtown Saturday street market from a few years back. The initial venture into local culture was a complete failure. Not a good first impression, but read on as she has some nice things to say. The second day wasn’t much better as she explored the city centre where the streets were half-deserted with only a few cars and trolley cars on the slippery streets and the subway stations looked abandoned. This was not a good start. Edmonton has numerous parks and colour public art that I am sure Morris would enjoy if she visited today. On the third day she “ignored downtown and went to the unmistakably indigenous quarter of Strathcona, whose very name struck me as allegorically of the country.” Here she found the archetypal prairie settlement of the 19th century, still recognizable and offers a homey contrast to the skyscraper clump in downtown. At the end of her fourth day she wondered “if the fantasy of West Edmonton Mall was the one thing in Edmonton that I really got the hang of. For the rest of the city seemed to be losing, rather than gaining, clarity in my mind…so indeterminate does the civic message seem to be. Edmonton has few instantly recognizable features, and so far as I could see no very pronounced local characteristics. Edmonton’s nickname in the ‘90s was “Deadmonton.” Fortunately, Edmonton has got its mojo back today. 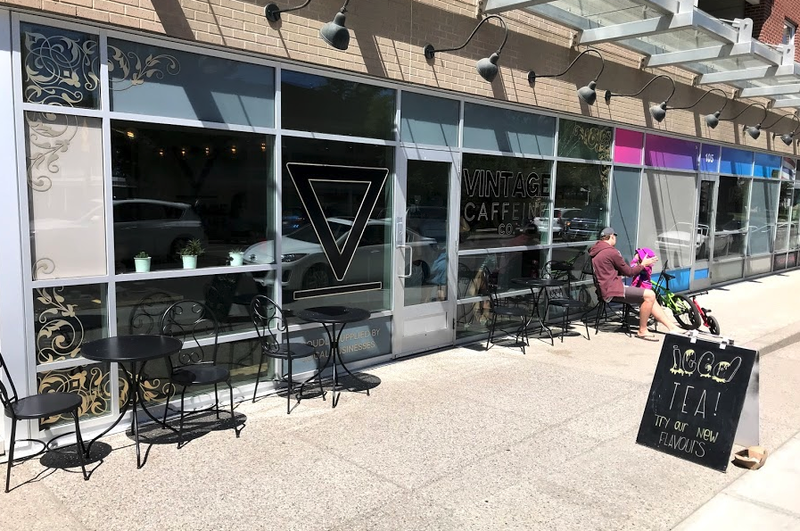 Edmonton’s downtown streetscapes have improved significantly since 1990. 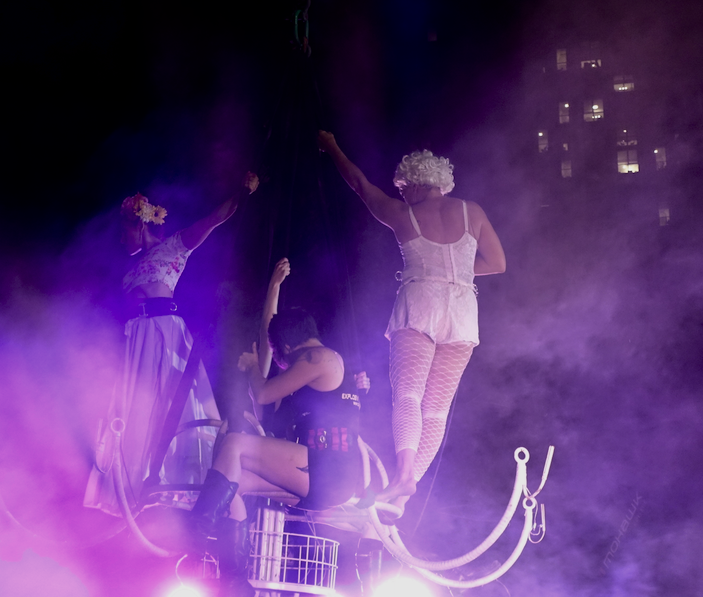 In her essay, you can sense Morris’ frustration that she simply couldn’t understand the city’s sense of place, or why anyone would choose to live there. It is too bad she chose to visit in the winter, I am sure she would have had a completely different experience in the summer. Still I am surprised she wasn’t able to understand how the West Edmonton Mall (WEM) was a logically adaptation to winter, providing a warm and inviting place for shopping, entertainment and recreation. How it became the city’s town square? 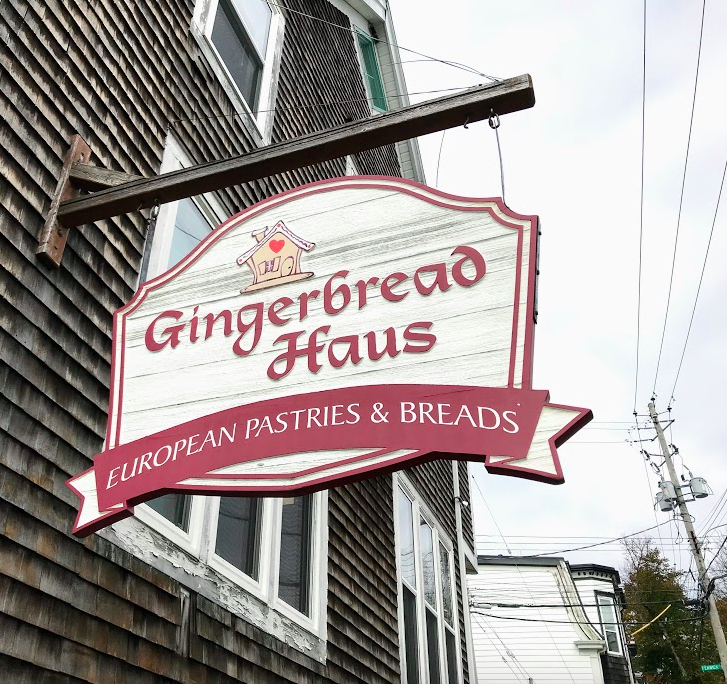 How it usurped downtown as the city’s gathering place. How it reflected a city dominated by its new suburbs. I couldn’t help but wonder why she loved Toronto’s Eaton’s Centre and hated WEM? Aren’t they pretty much the same thing? In fact WEM, has a better mix of uses. I also found it strange Morris was frustrated with the roads on her first day. I would have thought an experienced traveller would know anyone getting into a strange car and driving in a strange city almost always ends up getting lost and frustrated by the quirks of the city’s streets. The Art Gallery of Alberta adds some fun to Edmonton’s downtown. 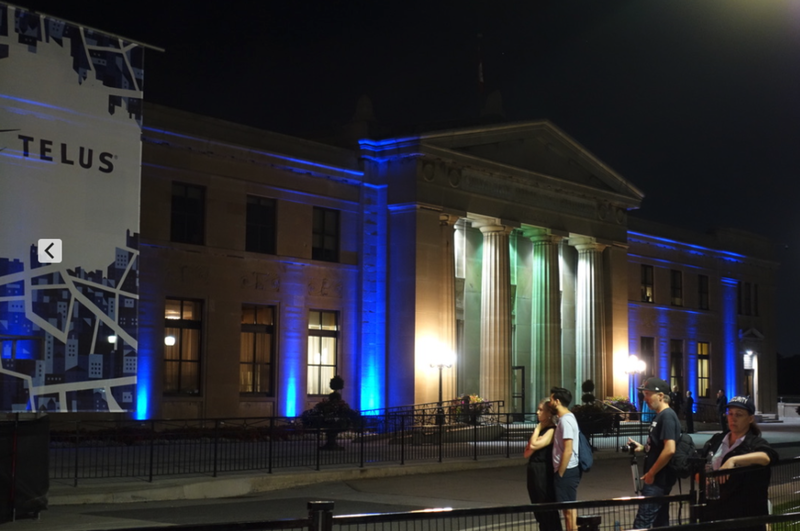 Alberta’s Provincial Museum that Morris liked has moved downtown’s cultural district. Edmonton’s downtown is in the middle of a mega makeover with several new residential buildings. 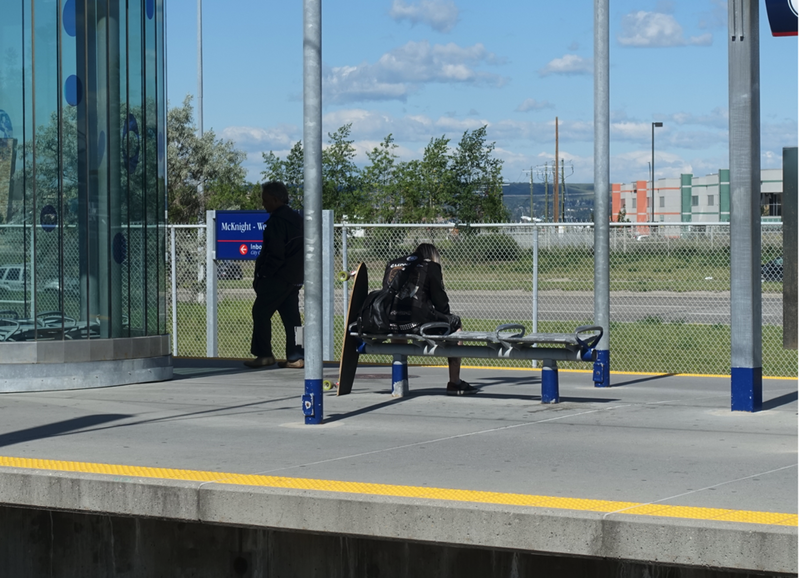 Even Edmonton’s suburban transit hubs are fun. I wonder what she would think of Edmonton today with its shiny new downtown toys - arena, art gallery, museum, office and condo towers. Surely, she would be impressed by how it has become one of North America’s best festival cities and how its river valley park system is one of the best in the world. And I wonder what she would think of Edmonton’s current “ICE District” bravado? Perhaps if she visited today, winter or summer, her essay would be titled Edmonton: An Eight-Day Week! It is amazing how cities evolve. 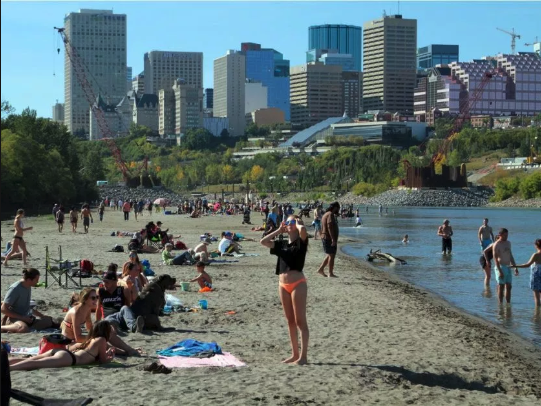 Edmonton vs Calgary: Who has the best River Parks? Canada: A Country Of Prosaic Cities - Toronto! I love flaneuring through the books in thrift stores and used bookstores to see if I might find a hidden gem. That is exactly what happened recently at J.H. Gordon Books on King St. E in Hamilton, Ontario. Often, I find books I didn’t even know existed, like Jan Morris’ “City to City” which is subtitled “through the eyes of the greatest travel writer of our day.” I have a couple of Morris’ books in my collection but had never seen this one. A quick check found it was published in 1990 and the cities ranged from St John’s and Saskatoon to Yellowknife and Vancouver, as well as a few cities in between. I thought it would be interesting to see how an outsider saw Canada and our cities almost 30 years ago (a generation). Needless to say, I bought the book. This is the image Jan Morris and most of the world had of Canada and Canada cities in 1990. 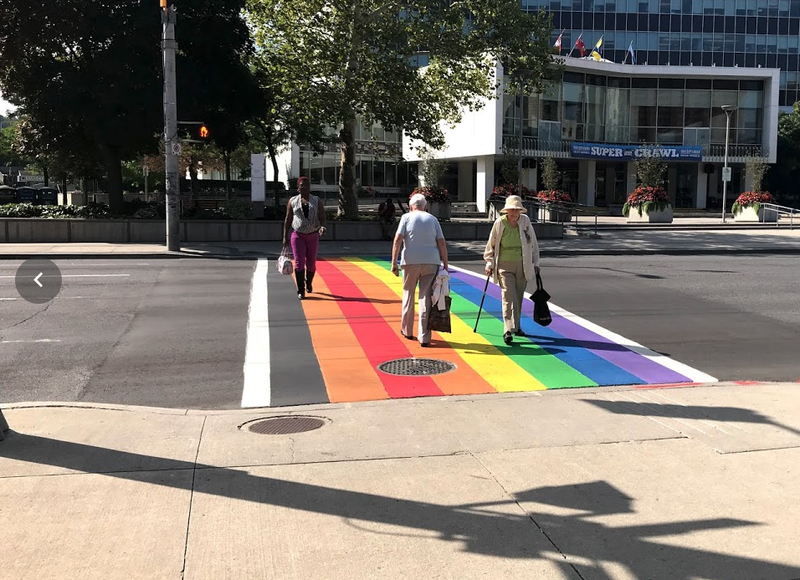 (photo credit: Tourism Toronto). She first visited Canada in the early 1950s, getting to know its cities and its people better than many Canadians ever do. Her comments about Canada and Canadian cities are often not very flattering and sometimes I wonder how, in such a relative short visit, she can feel so confident about her ability to capture the pulse and sense of place of a city accurately. Perhaps I am jealous? By the end I was amazed at how many times she used the word “prosaic” to describe Canada, and our cities. However, that being said, she does make some very thought provoking observations. Over the next few months I will share excerpts from her essays that were commissioned for Saturday Night magazine. She thought the word multiculturalism is to Toronto, what “ooh-la-la” is to Paris, “ciao” to Rome, “nyetto” Moscow and “hey you’re looking great” to Manhattan. Oh, how Toronto and Canada HAS changed. The transcontinental train is iconic no more, and Union Station is filled with day commuters, with briefcases, backpacks and coffee cups from edge cities, not people from the hinterland. Hard to believe the west was still thought of a Canada’s hinterland in the mid ‘80s by outsiders. Union Station is best known today as the hub of Toronto’s edge cities commuter system, not at the hub of the transcontinental train. Nobody, could possibly mistake this for a British City now.” “There is no mistaking this for a city of the United States, either….it is not a free-and-easy, damn Yankee sort of city – anything but,” she adds later. Frank Gehry’s addition to the Art Gallery of Ontario enhances Toronto’s image as futuristic city even if the streetscape is harsh. Royal Ontario Museum’s bold new addition by architect Daniel Libeskind was inspired by the museums gem and mineral collection. She postulates that if a nuclear bomb was to go off nearby, Torontonians would wait for the lights to change before running for cover. She also recognizes Toronto isn’t a “provincial city” describing it as a huge, rich, splendid city, a metropolitan in power, a money centre of universal importance. Yet, by and large it has escaped the plastic blight of contemporary urbanism. 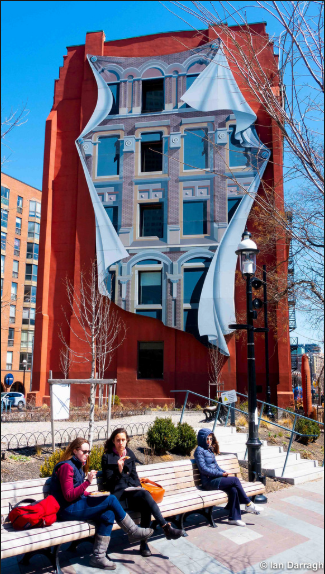 The Flatiron building built in 1891 by architect David Robert has perhaps Toronto’s most popular piece of public art. 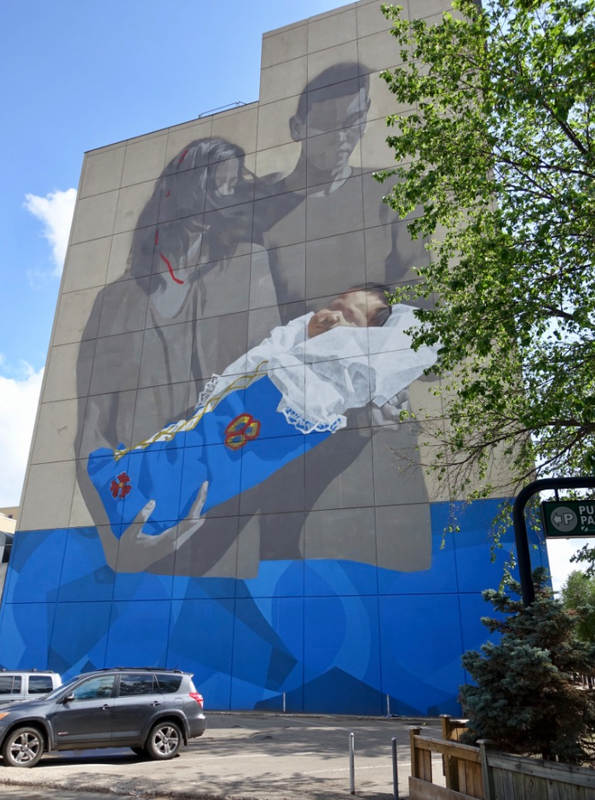 The eye-catching mural by Calgary artist Derek Besant was painted in 1998 and consists of over 50 panel attached to a steel frame mounted on the wall. Today more and more Canadian cities have scramble intersections for pedestrians like this one in Toronto. The Henry Moore sculpture outside the Art Gallery of Ontario is a popular place to play for children. Toronto’s Eaton Centre with its Michael Snow artwork of Canadian geese opened in 1977 and quickly became an iconic urban shopping centre internationally. It has been copied by most Canadians cities with poor results. Toronto’s new City Hall opened in 1965 and was the beginning of the city’s transformation into an international design city. Toronto’s underground PATH system is used by over 200,000 people daily. 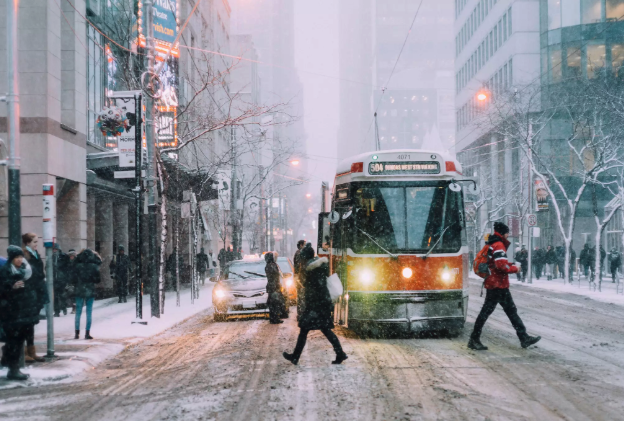 Toronto’s 30 kilometre long PATH system is recognized as an important element fo the economic viability of the city’s downtown core which is one of the strongest in the world. In the end she concludes, “Your heart may not be singing, as you contemplate the presence around you Toronto the Good, but it should not be sinking either. Indeed, Toronto has added over a million more people since 1990. The city centre is being transformed from a place to work to a place to “live, work and play” with the addition of hundreds of new residential buildings. 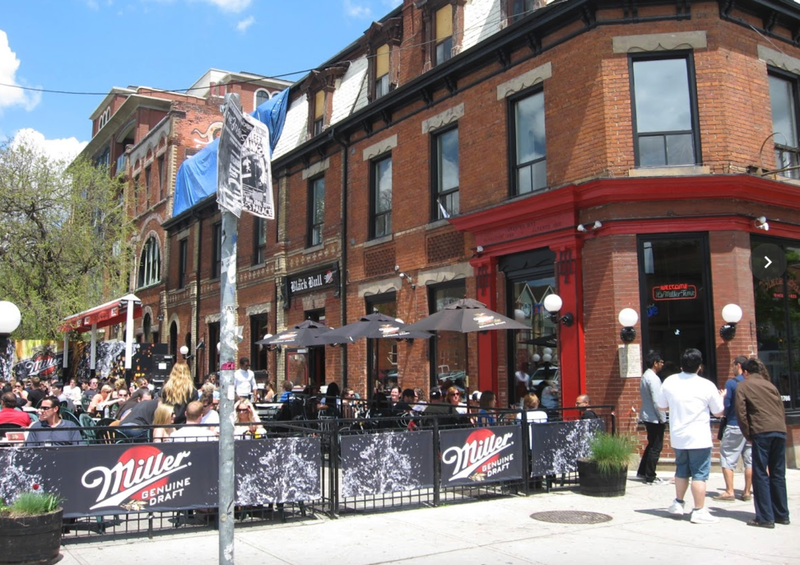 Sidewalk patios are common place in Toronto and Canadian cities today; this was not the case in 1990. Cycling and urban living is become more and more common place in Toronto and Canada’s other major cities. I have to admit I have never been a big fan of Toronto, but then most Canadians other than those living in the metro Toronto area seem to despise the city that thinks it is the “centre of the universe.” I am probably even more anti-Toronto than most as growing up in Hamilton we hated “Hogtown!” I was surprised on a recent visit to Hamilton how much the anti-Toronto sentiment still exists. Despite all the changes in Canada’s cities over the past 30 years I expect this is still the view most people outside of Canada have of our cities. 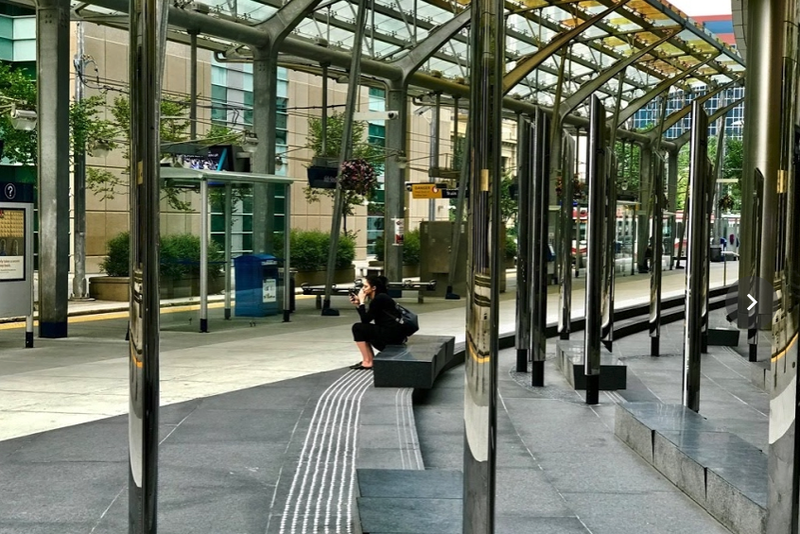 The key to city building is linking vision with the realities of the current market, economy and desired quality of life, as well as anticipating the future. It aint’ easy. 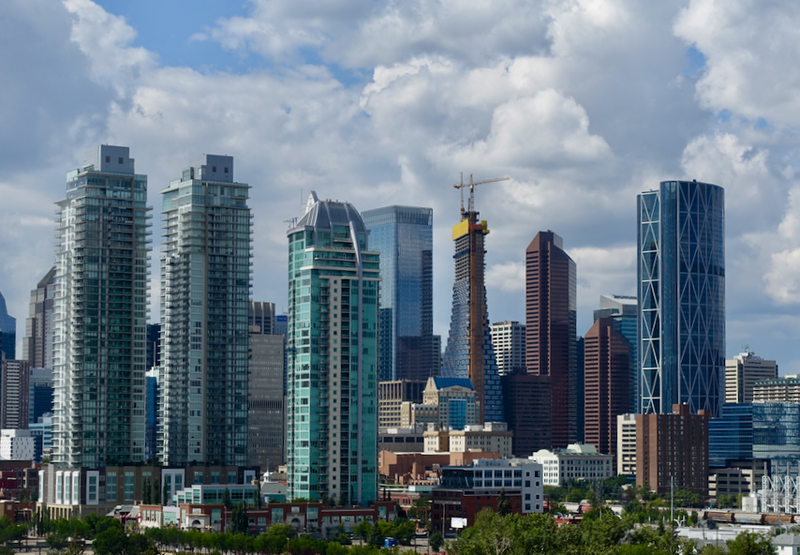 In Calgary, numerous residential towers are now an integral part of the urban skyline. Calgary's Beltline's streets are lined with new residential buildings with several more under construction. 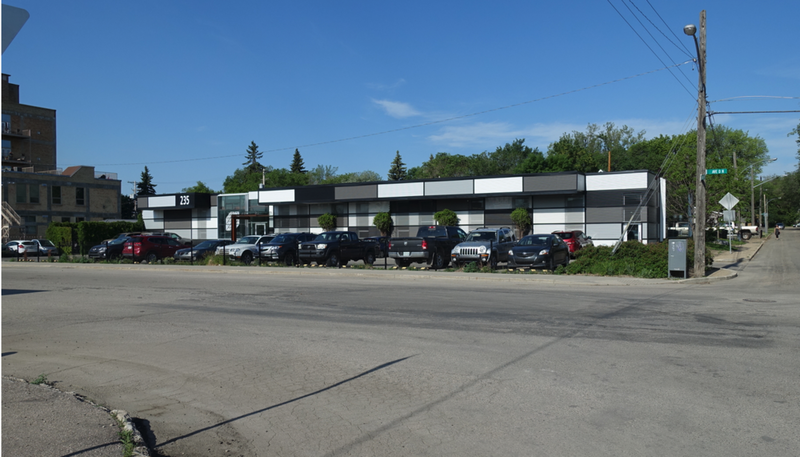 It is one of the City's fastest growing neighbourhoods. The same is true for Calgary, where dozens of new condos and thousands of infill homes have been completed in our inner-city communities since 2006, yet the vast majority of our growth has been in the ‘burbs. In fact, Calgary has the dubious ranking of being Canada’s leader in suburban growth with 91% of our growth being in the suburbs; followed by Edmonton at 90%, Montreal 84%, Toronto 83%, Vancouver 79% and Ottawa 74%. Recent Calgary population growth indicates that many of the communities near downtown are experiencing healthy population increases i.e. green areas. 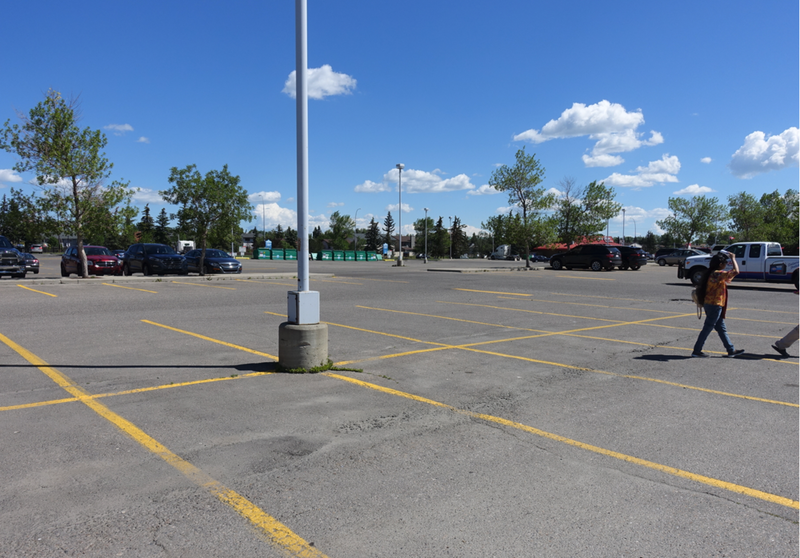 Is Calgary an urban densification leader? In fact, I contacted Gordon early this year to see if he could confirm my hypothesis that “Calgary was Canada’s leader when it came to urban densification on a per capita basis.” This hypothesis was based on the numerous new urban village projects at various stages of development in Calgary: Garrison/ East Village / University District / Brentwood Station / Bridges / Currie / West District / Quarry Park / SETON. Garrison Woods and Garrison Green alone added 5,000+ new residents in the early ‘00s. 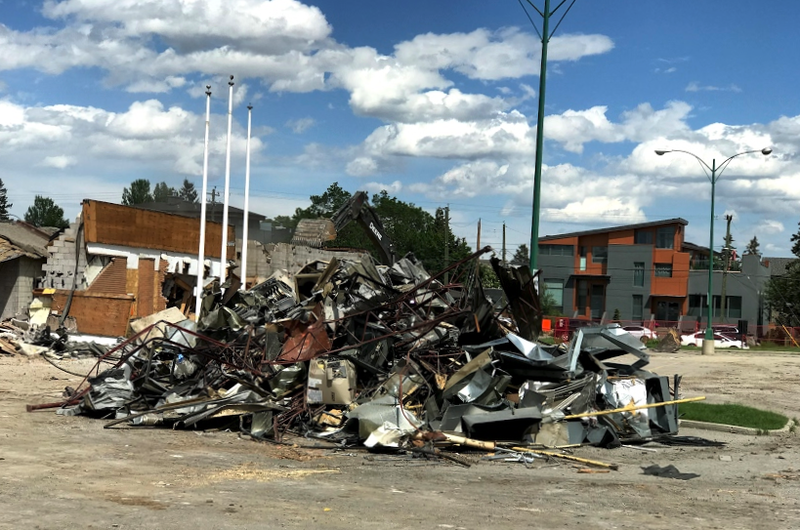 As well, the dozens of condos have completed, under construction or approved for the Beltline, Kensington, Inglewood and Marda Loop. 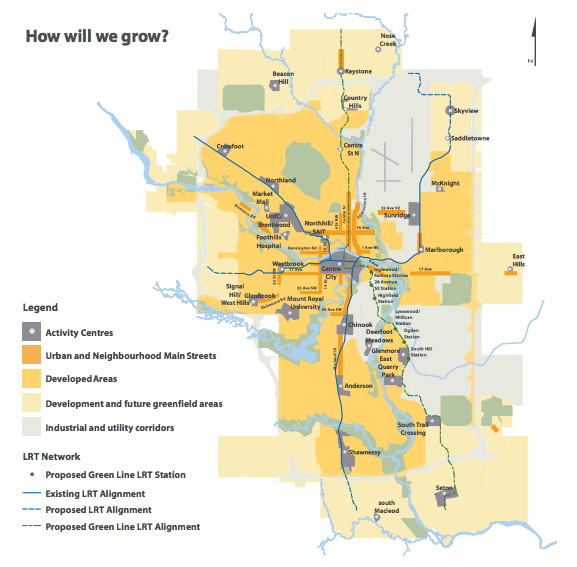 In fact, the 2017 Census showed the Beltline had the largest population increase of any Calgary community and that many of Calgary’s inner-city communities are indeed experiencing good population growth. 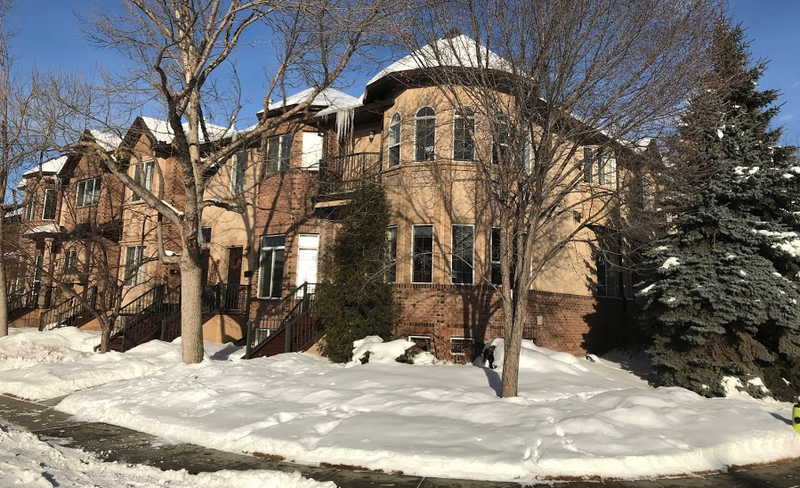 Perhaps, this is due in part to the 5,000 new infill homes (15,000 people at 3 people per home) in Calgary’s inner-city communities over the past five years. That is the equivalent of building two new Aspen Wood neighbourhoods. While I realize these projects were in their infancy from 2006 to 2016, I was hoping Gordon might have some stats and projections based on planned urban densification projects for Canadian cities. This didn’t answer my question, however, it did get me to rethink how we measure and think about inner-city and suburban growth. 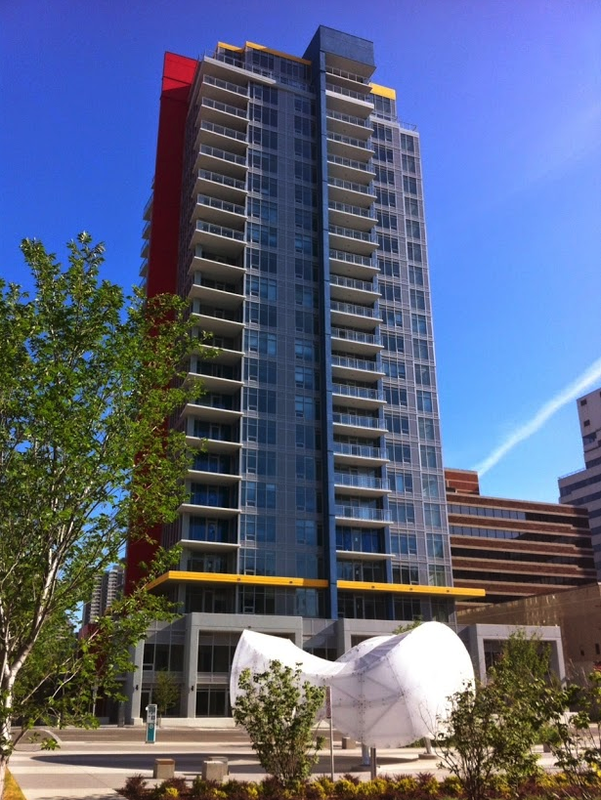 The Bridges project continues to add new urban homes for Calgarians including many families. 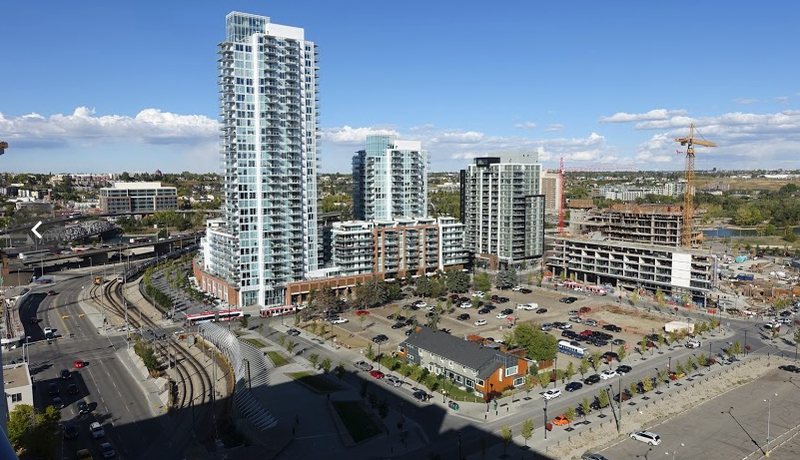 Calgary's East Village project will add 10,000+ new residents to the downtown over the next 10 years. Intuitively, I sensed we need to look at the population growth differently to understand what is happening. This led me to examining how the birth and death stats for suburbs vs inner-city might factor in. I contacted the City but they don’t track birth by new suburbs (developingcommunities is the City’s term) vs established communities (developedcommunities is the City’s term). A quick look at the demographics of new suburbs vs established communities and you quickly realize there is a huge difference that puts developed communities at a HUGE disadvantage when it comes to population growth. I decided to do some math. 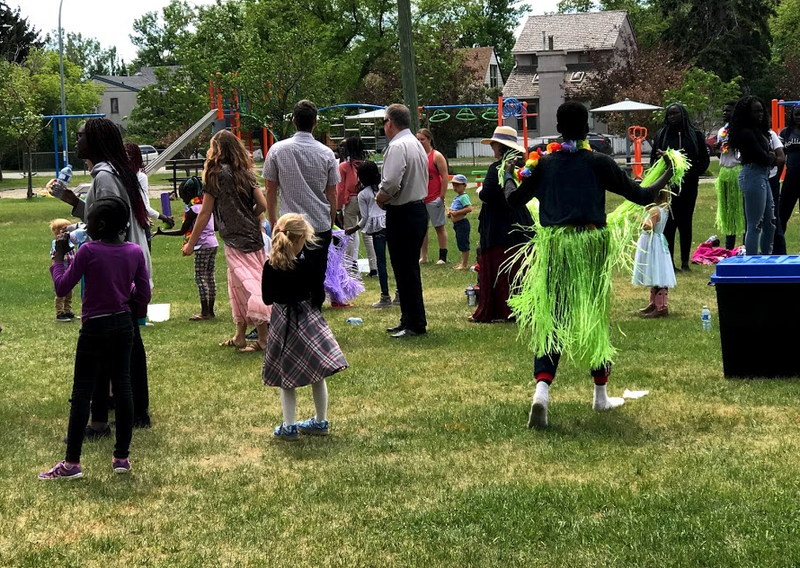 Each year Calgary has about 16,000 births, so let’s assume 70% of the births are in the newer communities or about 11,000, compared to only 5,000 in older communities. This means every year the new communities grow twice as fast without building a single home. Calgary averages about 5,500 deaths each year. If we assume 90% of the deaths each year are from established neighbourhoods (where the vast majority of the old people live) this means collectively they will decline by 5,000 people each year. Ironically, this is offset by the 5,000 births, so our inner-city’s natural population growth is neutral. Contrastingly, in new suburbs, there are 11,000 births and only 500 deaths, so the natural population increase is 10,500, about 50% of Calgary’s 21,000 population growth migration accounted for the other 10,500) last year (2017 Census). This is pretty rough math, but it demonstrates urban sprawl when measured by population growth is significantly skewed in favour of the new suburbs (whoops, developing communities). City of Calgary Community Profiles illustrates how new communities like Cranston have significantly higher numbers of children (red numbers) and less seniors than the city average (grey numbers). Many older communities have less children and significantly more seniors. The inner-city is also at a huge disadvantage in attracting population growth compared to new suburbs as a result of affordability. 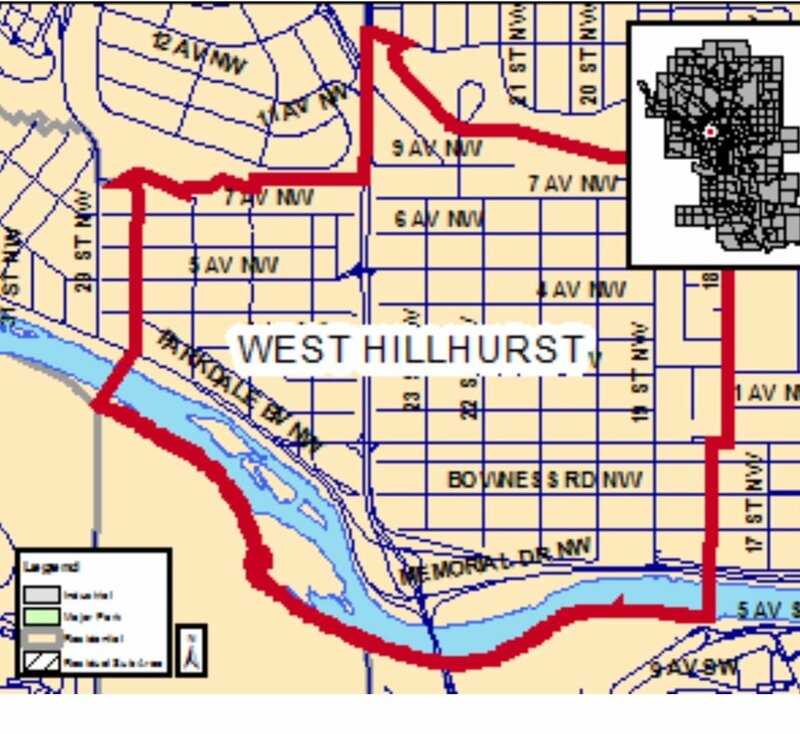 In 2014, I posted a blog documenting that 80% of Calgarians can’t afford to live in the inner-city where the land costs are many times higher than in a developing community. The cost of a home in an inner-city duplex can cost a million dollars and cost of a lot $300,000. 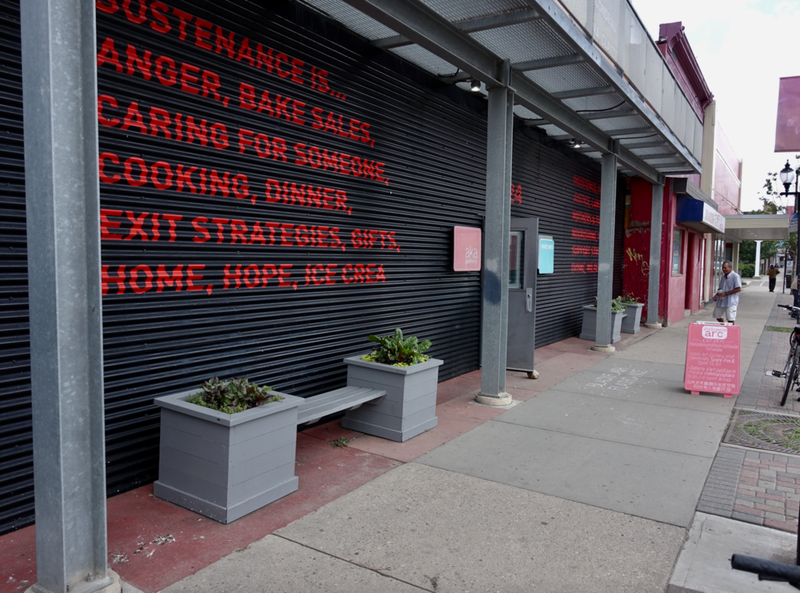 The cost of community engagement, complexity and uncertainties of the approval process also increases the cost of inner-city houses and condos. Affordability is a huge reason why not only Calgarians, but most Canadians HAVE to live in the new urban suburbs. Until, Calgary (or any city) can provide equivalent housing at similar costs in older suburbs, as they can in new suburbs, most of our population growth in our city will be at the edge. The issue is land economics and demographics, not urban design and planning. New master planned communities have a diversity of housing from low rise condos to row housing to estate homes. The master plan also integrates future employment and retail districts, as well as present and future transit oriented living. It should also be recognized new suburbs are not evil like those of the middle to late 20thcentury with their sea of cookie cutter homes and little else. New communities like Quarry Park, SETON and Providence are designed as “live/work/play” communities with a mix of housing (singles, towns, row and condos) with employment districts, as well as, retail, restaurant and recreational amenities all strategically located. They are designed to foster walking, transit and cycling as much as possible. In fact, Brookfield Residential’s Livingston neighbourhood will have 96% of its homes within 300m of a transit stop and a density on par with Hillhurst/Sunnyside. 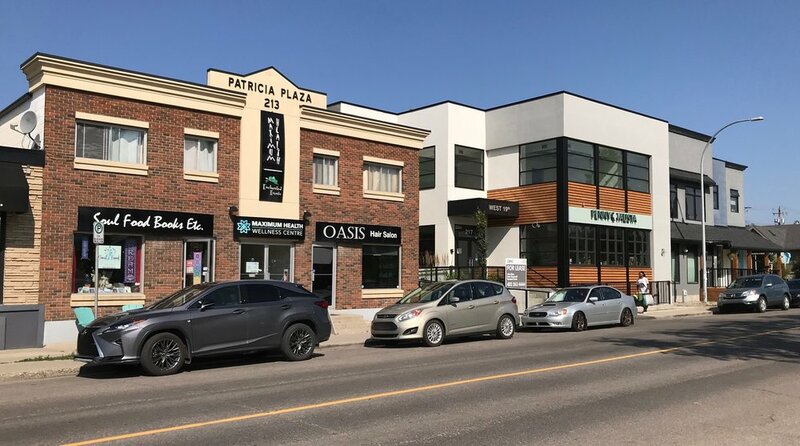 Indeed, Calgary’s new master-planned communities are a hybrid of the low-density, big box suburbs and the mixed density, main street urban villages of the future. While they aren’t perfect (no community is) they reflect the needs of today’s families for a community that has most of its amenities just a short drive away and in some cases within walking and cycling distance. And is affordable! Typical '50s or '60s street with single family, single story homes are large lots. While many once housed 6+ people today they are home for one maybe two people. Streetscape in the new community of Livingston has two story homes on much smaller lots than those built 50+ years ago. This looks like inner-city communities without the trees. Studies like Gordon’s don’t help us understand the complexities of city-building and managing urban growth. The media loves to grab these studies and create a sense the “sky is falling.” That simply is not true. In reality Calgary and all Canadian cities are evolving to become more densified and more transit, walking and cycling friendly. However it is too quickly for some and too slowly for others. While Calgary like all Canadian cities is focused on trying to manage growth without sprawl it is very difficult due to not only demographic differences, but also do to job employment growth being primarily on the edge of the city. Calgary is evolving into five different cities! Hamilton’s Corktown Tavern is probably one of the best small live music venues North America. I say this based on the numerous live music venues I have visited in music cities like Austin, Memphis, Nashville, as well as Dublin over the past few years. My discovery of it was a bit serendipitous. 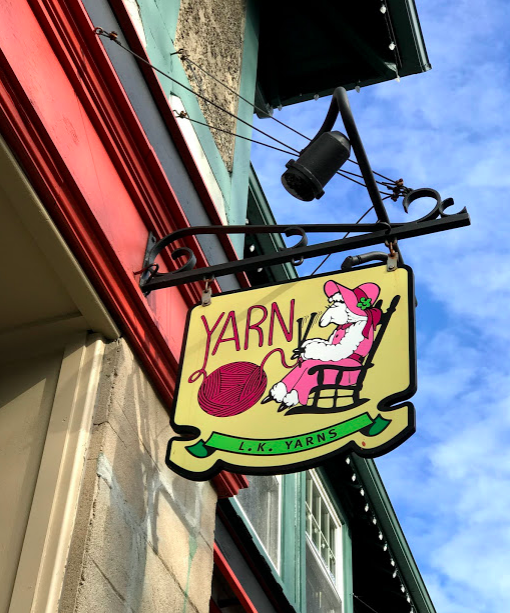 A recent visit to Hamilton, to visit my mother who happens to live in Corktown resulted in me asking around about live music venues. 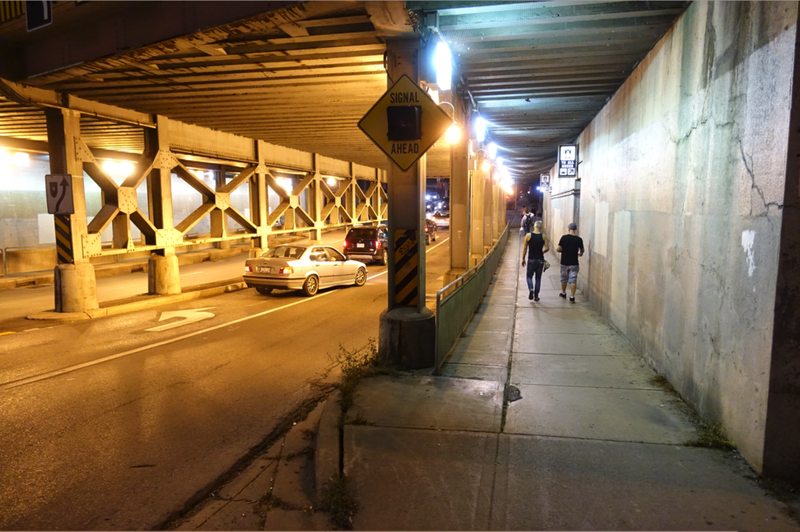 When someone suggested the Corktown Tavern, I thought “I perfect can walk there.” I love to listen, drink and walk! The first time I went was for the Friday night Kitchen Party. But the place was packed and we couldn’t get in. Lesson learned: Get there early or make a reservation. 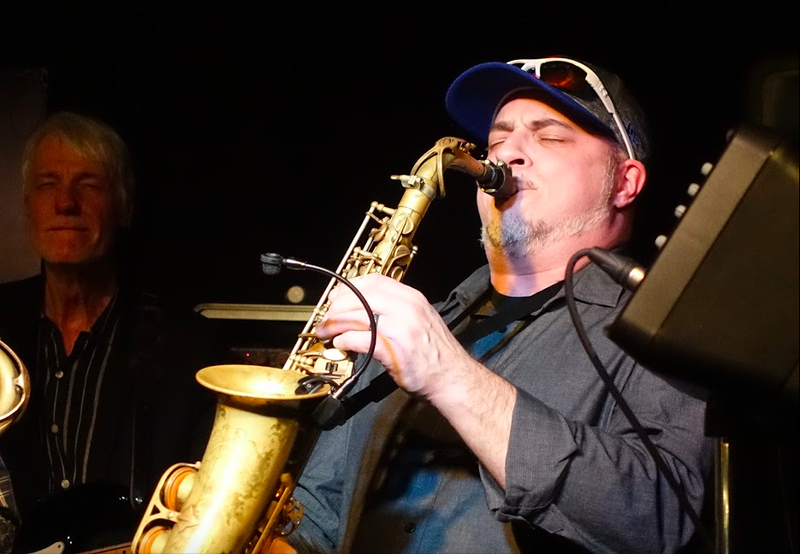 I then went back for the Sunday afternoon Blues Matinee to hear Brent Parker and the Corktown Blues Band. Again, I got there in what I thought was good time, but the place was again packed. Lucky for me, I found a single seat near the front and was warmly welcomed by the couple already there to join them. Gotta love the friendly atmosphere! As soon as the band started to play, people were up dancing - always a good sign in my mind as it means people are engaged and enthusiastic. The music was great as was the people-watching. The band put on a great show and the acoustics were great – what’s not to like. At the break, I struck up a conversation with my table mates, quickly learning they were regulars and that this Sunday matinee was typical of most Sundays. I was impressed. They strongly encouraged me to also check out the Tuesday Irish Jam. So, Tuesday night I headed back to Corktown Tavern for dinner with my brother and open mic night presented by the Hamilton Irish Arts. As we enjoyed the burger and beer (both very good), musicians started arriving and sitting at tables in the dining room and unpacking their instruments. Over a period of 30 minutes, 16 musicians of all ages arrived and were soon jamming in what was a magical experience. 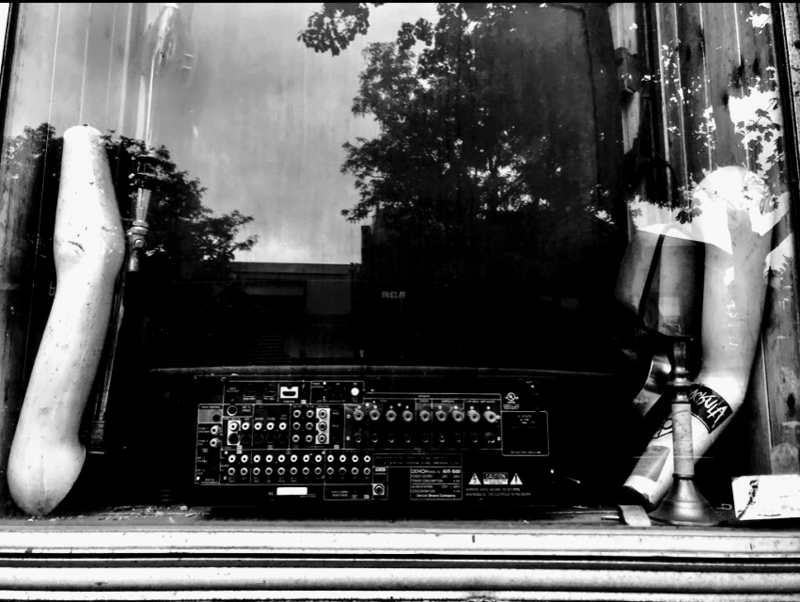 It reminded me of a Saturday afternoon jam in Dublin where seven musicians jammed on a Saturday afternoon in a micro pub creating an unforgettable experience. 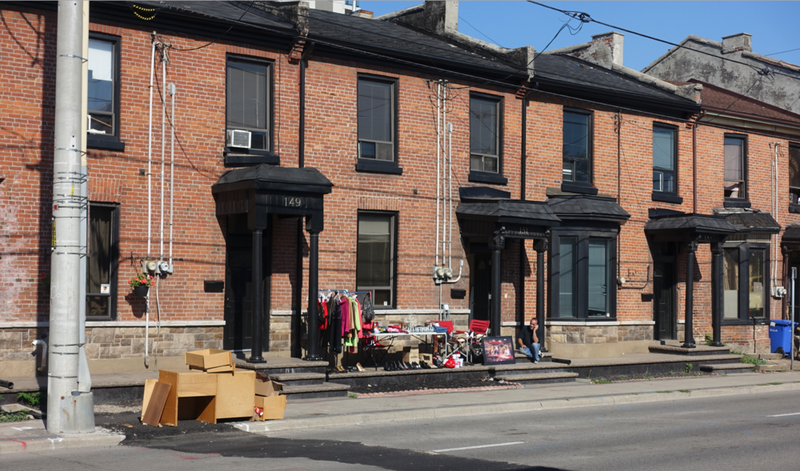 Corktown, one of Hamilton’s oldest neighbourhoods dating back to the mid 1800s, was home to many of the early Irish settlers in Hamilton. The pub building itself dates back to 1880s and has been a live music venue since 1931. Over 10,000 bands have graced its stages, including the Tragically Hip, Blue Rodeo, Arkells and Tom Cochrane. It even hosted Jeff Healy’s last show, just 4 weeks before his death in 2008. 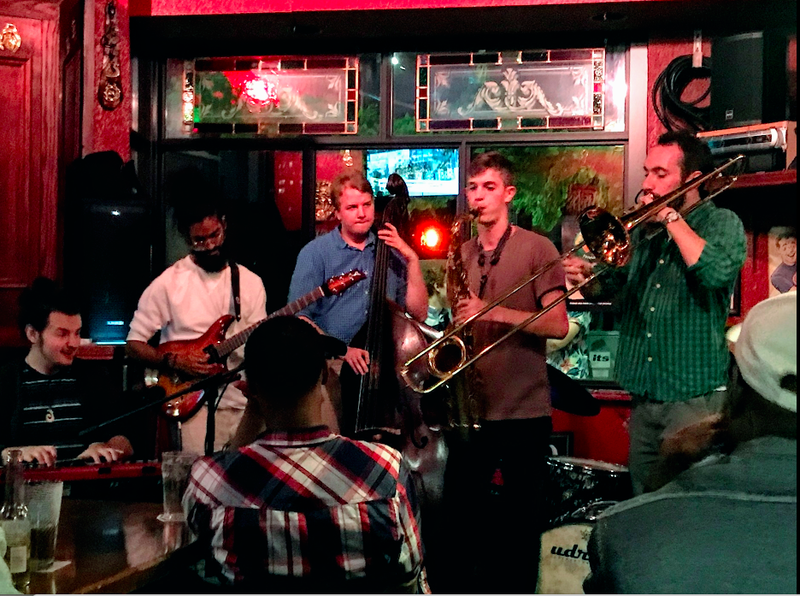 And if Corktown Tavern isn’t working for you, check out the Cat & Fiddle a few blocks away it also has live music every night. Corktown is a wee bit of Dublin in Canada. Calgary: North America’s Newest Music City? Welcome to the era of neuro-design? 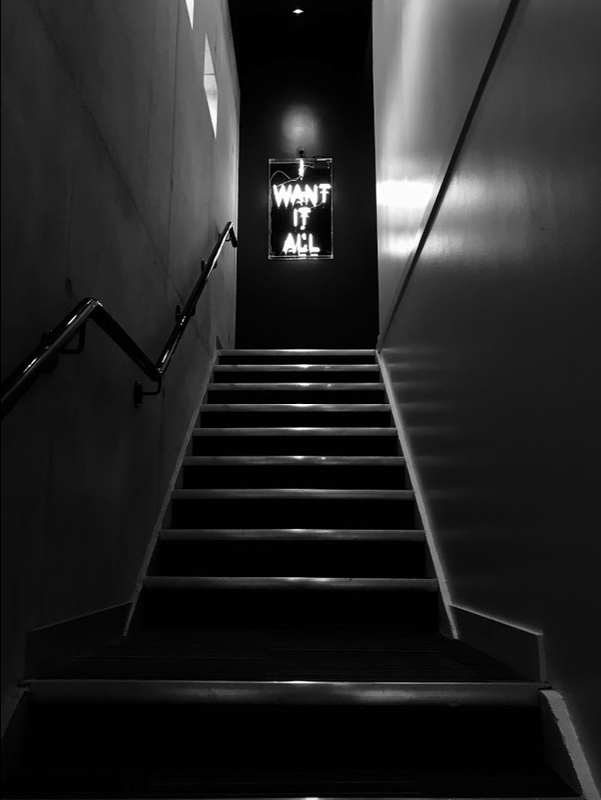 Could it be that in the near future urban designers will be collaborating with neuroscientist and psychologists to design buildings that make people feel comfortable rather than disoriented and encourage socialization vs isolation that is too often the case. It could happen! It has happened? 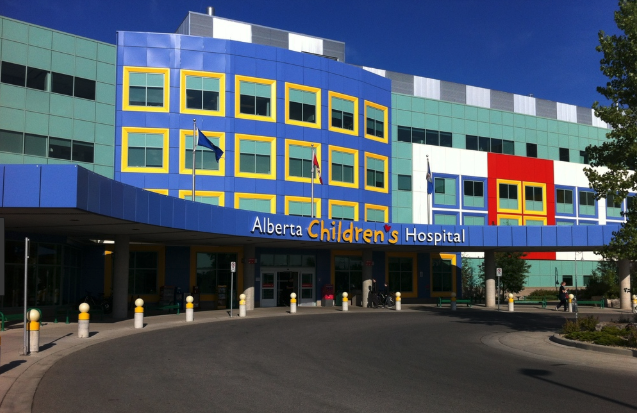 In fact, the Alberta Children's Hospital was designed based on input from the children who wanted large windows and bright colours. They wanted it to be a happy looking place. Perhaps rather than consulting with neuroscientist and psychologists the design team should consult with the end users more. To me this is a happy, welcoming place - exactly what it should be. The old children's hospital was a dull, depressing, institutional building. Indeed, the Conscious Cities Conference in London in 2017 brought together architects, designers, engineers, neuroscientists and psychologists, all of whom cross paths at an academic level, but rarely do so in practice, to discuss how they might collaborate. Intuitively we all know the shape, colour and size of buildings affect the mood and well-being of humans. Now scientists have discovered specialized cells in the hippocampal region of the human our brains that processes each individual’s unique sense of geometry and space. 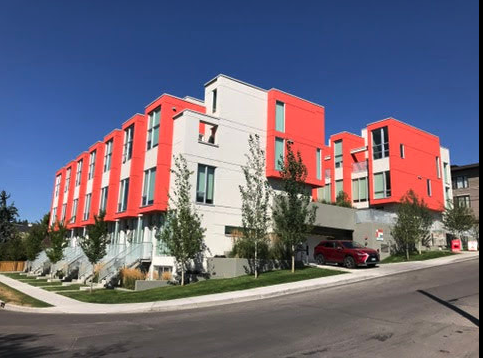 More and more architects in Calgary are using bold colours as a key element of the building's facade. 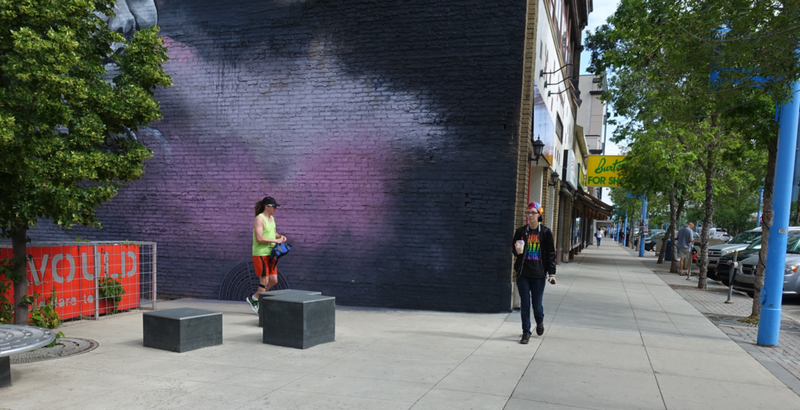 Public art is also being use more to create a more varied and interesting streetscape. 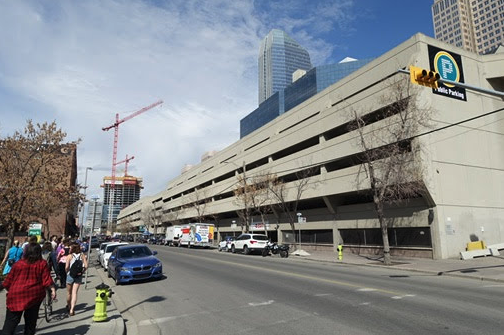 Calgary's City Centre parkade is a good example of late '70s early '80s bland, utilitarian parkade design. 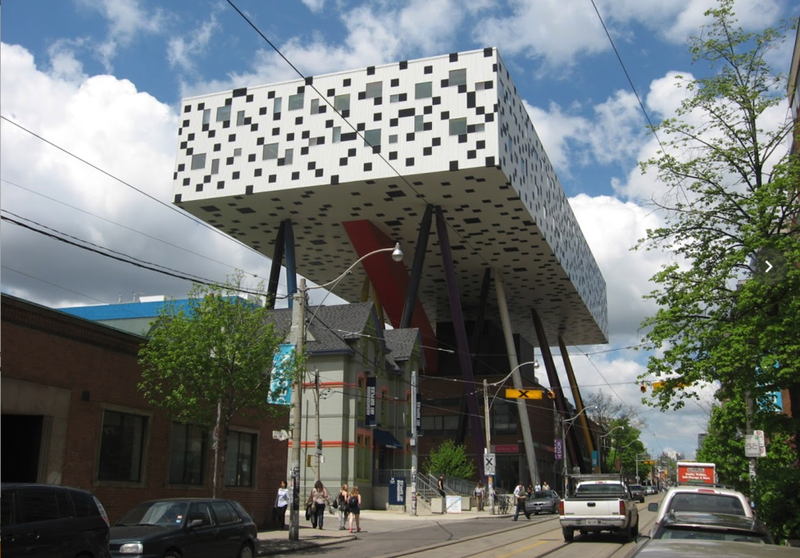 The Centennial parkade is a good example of how modern parkades are created to enhance the sense of place. In this case the parkade mirrors the warehouse history of the land next to the CPR tracks in its use of brick and its height. 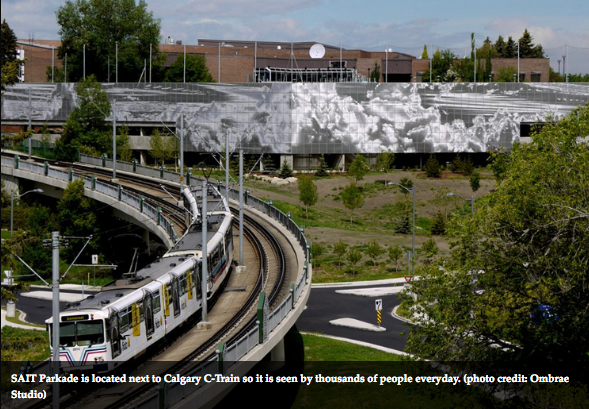 The SAIT parkade is also a huge mural that can be enjoyed by tens of thousands of LRT riders everyday. It is a work of art! No more blank walls! Using modern technology scientists have attempted to measure humans’ physiological responses to architecture and streetscapes, using wearable devices such as bracelets that monitor skin conductance (a marker of physiological arousal), smartphone apps that ask subjects about their emotional state, and electroencephalogram (EEG) headsets that measure brain activity relating to mental states and mood. A recently published study using visual reality technology concluded most people like curved edges and rounded contours rather than sharp-edged rectangular shaped buildings and rooms. 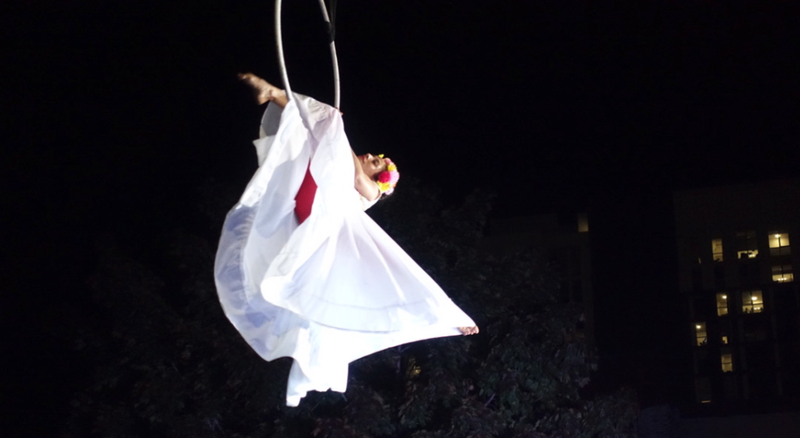 However, the design students among the participants preferred the opposite. This could be a red flag! A study in Iceland found participants viewed various residential street scenes and found the ones with the most architectural variation the most mentally engaging. Not exactly rocket science, Jane Jacobs (author book “Death and Life of American Cities” in 1961) and others have been saying this for decades. 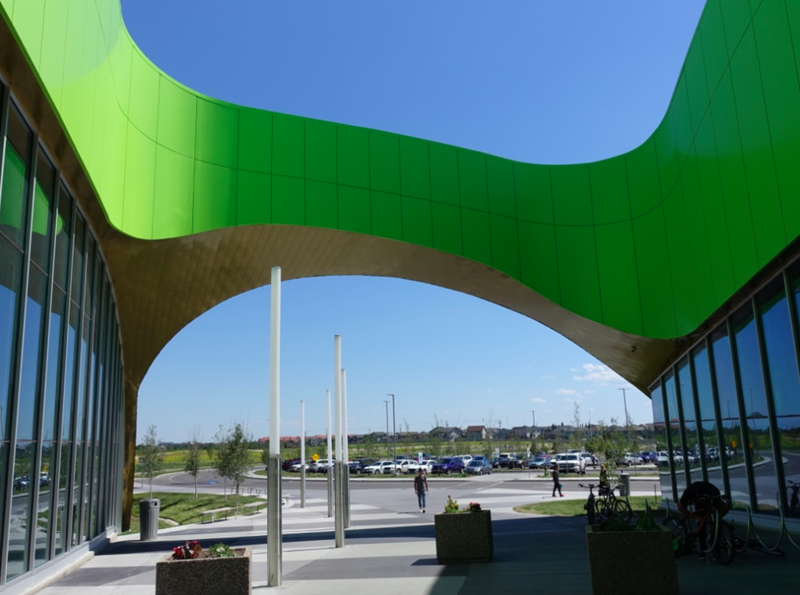 The curved staircase at Calgary's new Shane Homes Rocky Ridge Recreation Centre is an example of creating more public friendly urban design. The Royal a condo/retail project is an example of the sharp edge rectangular design preferred by urban designers. Another study looked at street patterns and found being lost and disoriented creates negative feelings. Cities with grid-pattern numbered streets like New York are easy to navigate London’s hotchpotch of neighbourhoods all orientated differently is notoriously confusing. Another study documented districts with high-rises are more confusing and unpleasant to walk around than those with low-rise buildings. Urban streetscapes like this are not public friendly. The fact that design students in the virtual reality study preferred hard-edges and rectangular shapes the opposite to the general public participants is a definite red flag. Could it be the brains of those attracted to the urban design professions are wired diametrically opposed to the general publics? That would be an interesting study! I know when I was a public art gallery curator it was obvious to me there is a huge gap between what artists and curators finds interesting and what the public like to see in the way of art exhibitions. Hence the term “art for art’s sake” i.e. that the chief aim of a work of art is the self-expression of the artist. Could the same be said for architects, landscape architects or interior designers? Could that be why they design minimalist buildings, lobbies and public spaces that are often alienating to the public? Are they designing for themselves and their colleagues not for the public? The question is: “Would architects, landscape architects and interior designers be willing to collaborate with neuro scientists and psychologist to have they designs tested to make sure they are “people friendly” before they get built. 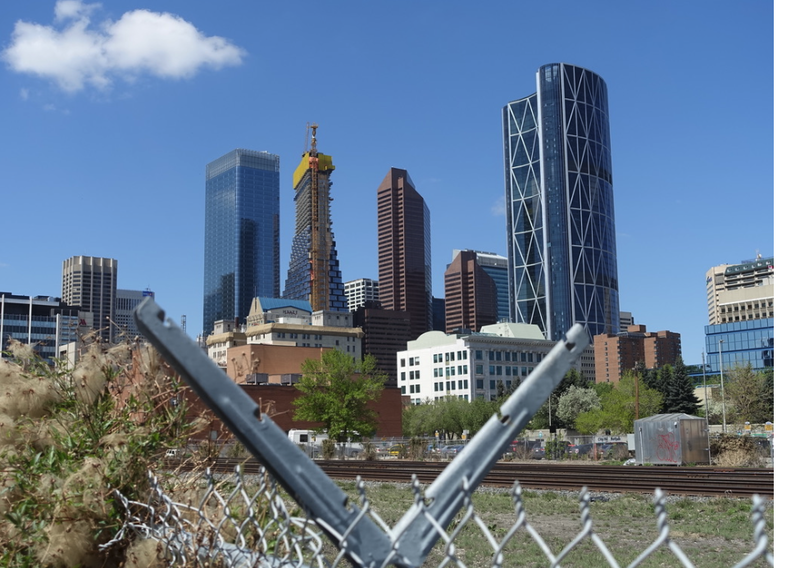 Calgary's four tallest buildings illustrate how architecture has evolved from the early '80s (Suncor Energy Tower, former Petro Canada Tower) to the new Telus Sky currently under construction. Brookfield Place is a good example of minimalist architecture with its monolithic, monochromatic, translucent glass facade from the base to the roof. Unlike the big box offices of the '70s it has rounded corners to give it a softer appearance more elegant appearance. The triangular Next Tower, formerly Nova Tower, would be a good example of the hard-edge minimalist architecture of the '80s that some found very confrontational. Telus Sky is the polar opposite of Brookfield Place with its articulated facade that tapers as the use changes from office for the lower floors to residential for the upper floors, creating an intriguing and unique shape. Bow Valley Square is a good example of '80s rectangular office tower architecture. A quick email to a few architects resulted in some interesting comments. Charles Olfert a principle at aobdt architecture + interior design in Saskatoon perhaps said it best, “I do think the education of architects plays a big role in the way we design and perceive beauty in buildings. However, Olfert thinks “to try somehow do a scientific and social analysis of aesthetics doesn’t seem useful. 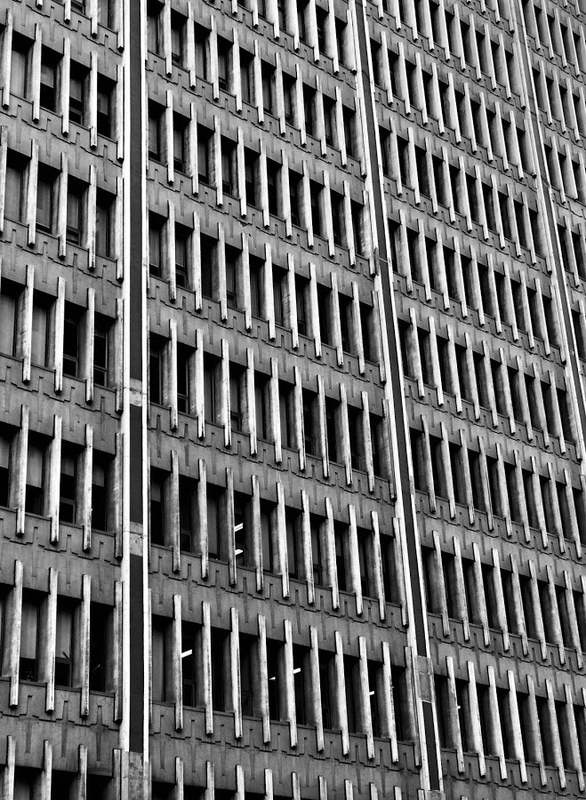 I have come to appreciate much later in my career the experience of a building is really complicated and aesthetics might be a relatively minor factor. Why are you at the building? Does it work for what you wanted? Do you already have some preconceptions because of who owns it, works in it or what it represents? What’s the neighborhood context? The new Mount Royal University's parade uses vertical neon green bars to break up what would have been a dull horizontal wall. The designers of this is small condo project in the Marda Loop used colour to create not only a playful rhythm but to add the illusion of huge windows. To me this is a happy building. Architect Jack Long's 1961, Calgary Planetarium and Science Center was a classic example of "Brutalist" architecture. The colour elements were added later to make it more child-like and playful. Or as some might say "tarted it up!" 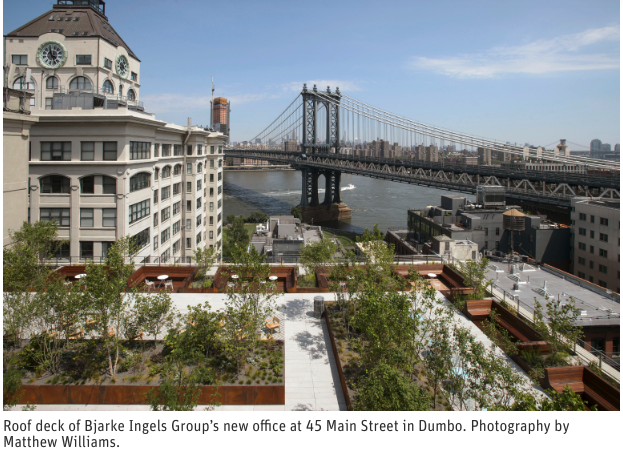 Are architects doing better job? Do we like The Princeton better than Eau Claire 500 condo next door? Do we like the condo towers in East Village better than those built in West Downtown in the ‘90s? Do we like the University City’s bold yellow, orange, green and red towers at the Brentwood LRT Station better than SASS0 and NUERA at Stampede Station? Do we like the new condos being built today at SETON compared to those around Market Mall in the ‘70s and ‘80s? Princeton condo (on the left) is an example of theearly 21st century's architecture with a distinct base, middle and roof-top, softer edges and warmer colours. 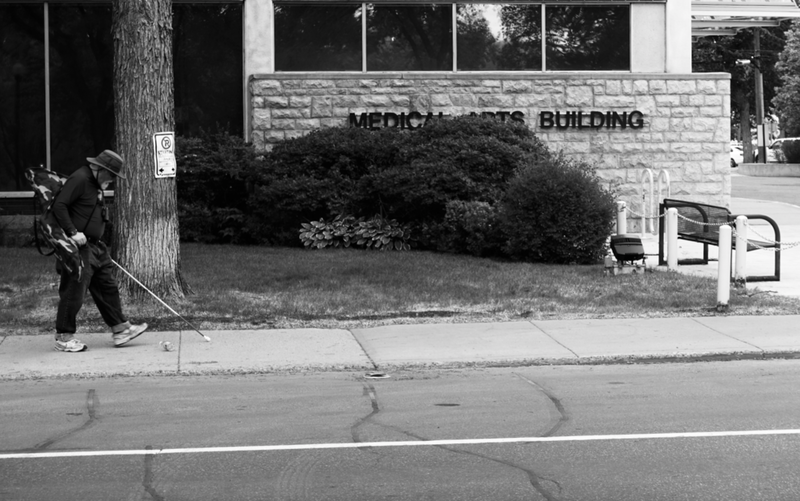 On the right, is the '80s architecture of Eau Claire 500 with its hard edges, flat facade and brooding colour. 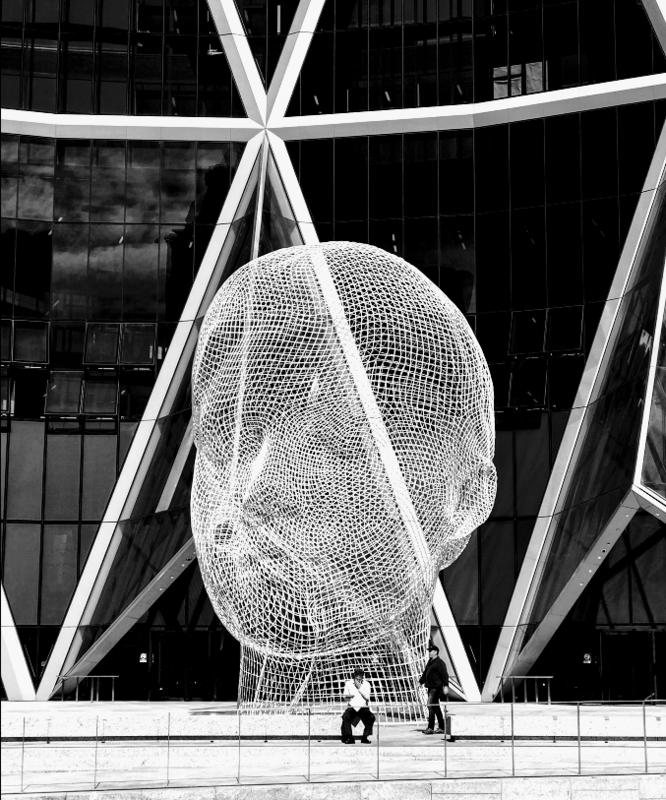 Do Calgarians like The Bow with its curved shape and diagonal lines, plaza and public art, better than the minimalist Brookfield Place with its rounded edges and public lobby. Do we like edgy Eighth Avenue Place with its articulated roof top, vertical thrust and cathedral-like lobby versus it neighbour Husky Towers with rounded gold coloured glass edges. 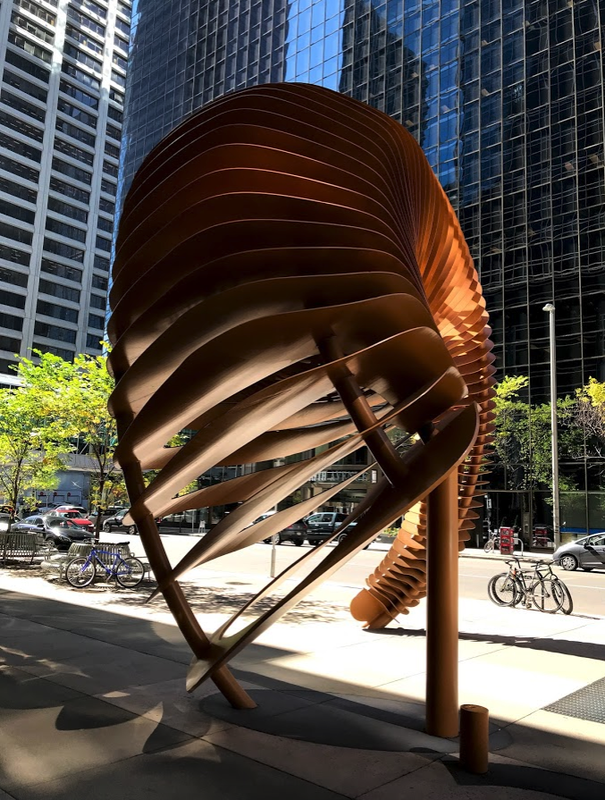 Do we like new Telus Sky with its twisted articulated façade and strange bottle-like shape versus the oval-shaped reflective deep blue glassed 707 Fifth street office building? How do they compare to ‘70s TD Square or Scotia Tower and the ‘80s Bankers Hall? Do we like the oval shaped, patterned façade of the new Calgary Central Library better than the strange shaped, dark snake-like skinned of National Music Centre or translucent glass, crystal shaped TELUS Spark building better? How do they compare with the Glenbow? 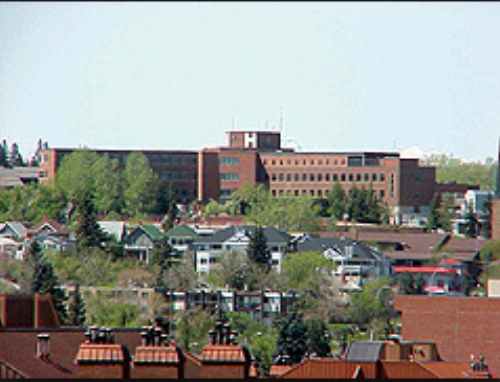 Do we like the South Health Campus building better than the Rockyview Hospital? Calgary's new central library has many of the elements that neuroscientist and psychologists say make a building more public friendly. 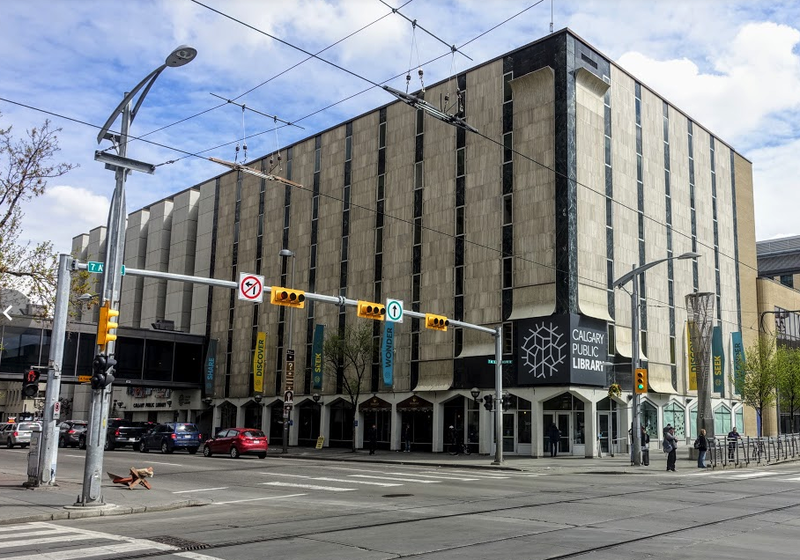 Calgary's old Central Library opened 1963 as part of an urban renewal project planned for the Downtown's East End. Could it be that those big square box office and residential buildings that dominated Calgary’s City Centre in the mid to late 20thcentury actually negatively affect our mood and well-being. 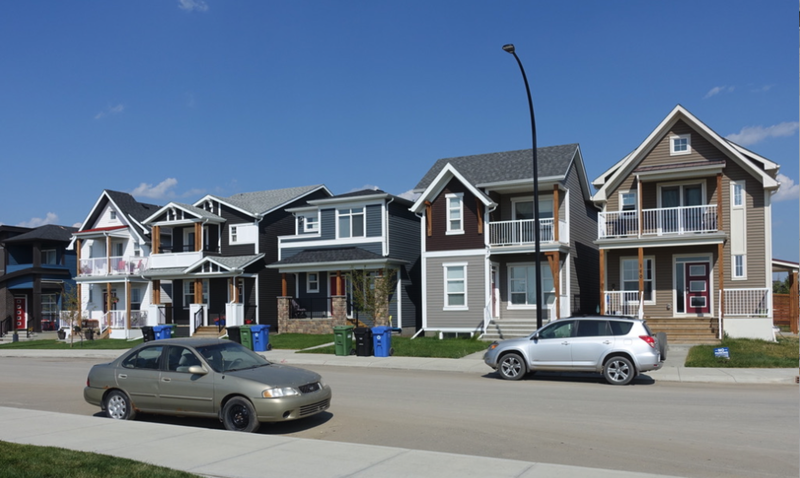 Could it be Calgary’s cookie cutter suburban homes and boring streets also negatively affect our well-being? What about those big box power centres - are they places where we want to linger and socialize with family and friends? I received several emails in response to this blog. I thought this one from Art Froese, who was the project manager for the Alberta Children's Hospital was particularly enlightening. Round is the world of our historic ancestors. Every aboriginal shelter is round: teepee [really egg-shaped]; igloo; gurt in Mongolia; African homes, crawls etc; Australia - follow the list. Round is harder to build. The Children’s Hospital gathering space in the middle of the building is round. This is not an accident. The philosophy of the building is three concentric circles: the children; the caregivers; the landscape. It took forever to get the architects to understand the concept. It took seconds for my native advisory panel of Elders from Treaty Seven to understand. The biggest price we’ve paid in developed countries is that we’ve dulled our senses. I have many examples of this from my wilderness adventures. Or just read “Tribe” by Sebastian Junger. Urban Design: Does Anybody Really Care? Brooklyn has been on my list of places to go for a few years now as I have been reading and hearing lots of interesting things about its renaissance. 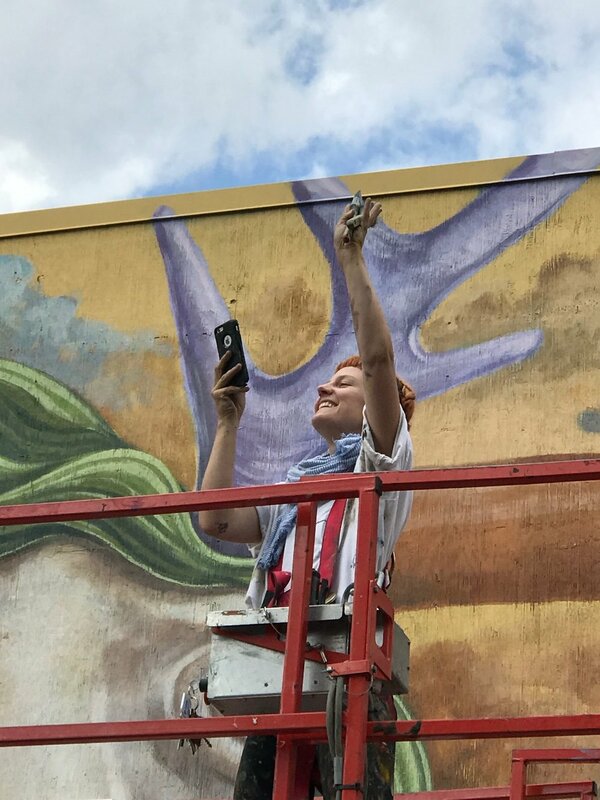 I was a bit jealous when I recently learned my friend Tom Tittemore (architect and public art advocate) was heading to Brooklyn so I told him to take lots of photos and perhaps think about doing guest blog. 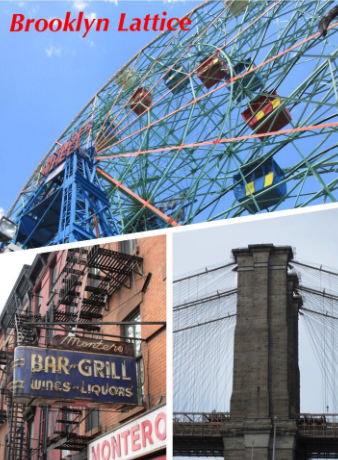 I recently enjoyed my fifth visit to New York City, and planned a day visit to Brooklyn as part of my ambitious itinerary. This Borough of NYC was a complete mystery to me, although walking across the Brooklyn Bridge for the first time on New Year’s Day in 2015 provided some initial, fleeting glimpses. 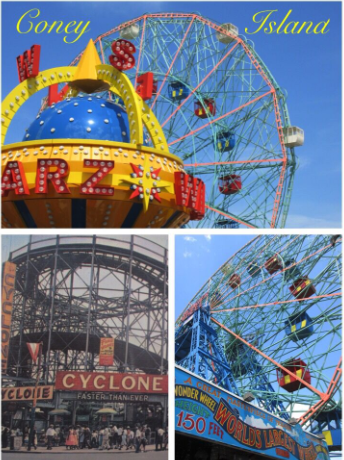 Coney Island, Carol King and the Brooklyn Dodgers were some of the cultural references I had accumulated over the years relative to this renowned community. Joined by my wife Carol, and dear friends Terry and Denise from Kitchener, I embarked on the ‘F’ subway mid-morning from the Rockefeller Station in Midtown Manhattan. Upon leaving the underground section beneath the East River, the ‘F’ line continued on an elevated platform for the better part of an hour, offering wonderful vistas of Brooklyn until we reached the end terminal at Coney Island. The Atlantic Ocean, Brighton Beach, protruding wharves, the Boardwalk, embellished storefronts and rectangular designated ride ‘precincts’ define the ‘layered’ parti of this iconic midway. 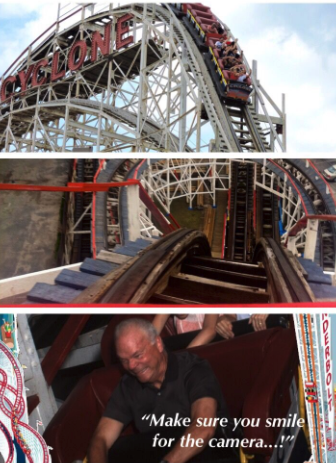 I took a ride on the ‘Cyclone’, constructed in the late 1920s and a true Mecca for rollercoaster enthusiasts. Enjoying the front seat solo, my smile changed quickly to a grimace once the G forces kicked in on the first vertical plunge. Exhilarating!! Atlantic Avenue’s western end merges gracefully into the promenade of the Brooklyn Bridge Park, an inspiring redevelopment of the former Brooklyn dockyards. 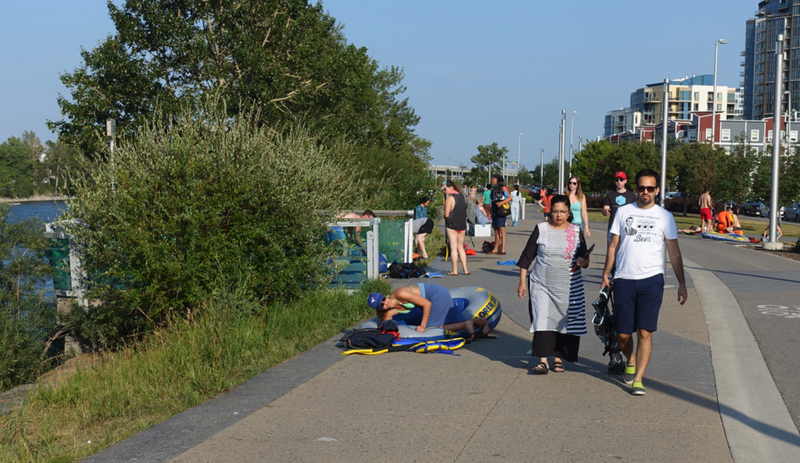 A number of the former piers have been repurposed into popular recreation zones. 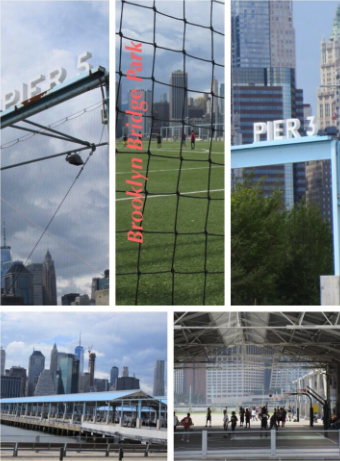 Pier 3 is a soccer pitch and Pier 5 accommodates a number of short basketball courts. Along the entire Parkway, tremendous vistas of lower Manhattan are presented, ending, of course, at the Brooklyn Bridge. My second trek across the Bridge was every bit as memorable as the first. Crowded, a bit dangerous with cyclist sharing the route – a complete New York experience. The north-east ‘F’ Line concludes at the Jamaica Station in Queens. 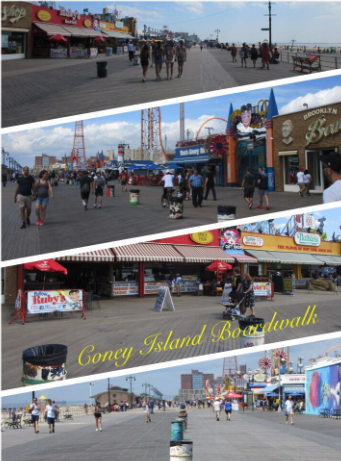 Guess where I’m going next time I visit The Big Apple! The overall subway experience highlighted by the Rockefeller Centre station, the panoramic, above grade trip through Brooklyn itself, the middle / Coney Island Station, and the end / Grand Central Station made me think Calgary should aspire to having a light rail transit system with such iconic and memorable stations that invite people to simply travel the system for its own sake and explore the city. The development of Calgary’s Bow River promenade has the same basis as the Brooklyn Bridge Park, albeit on a significantly reduced scale: meandering beside a significant river, views to prominent and in most cases good architecture, places for rest and people watching, natural landscaping, higher density housing, complimentary pedestrian and cycling lanes, local history made it a very pleasant experience. Brooklyn Bridge reminded me that sometimes, you need to invest in unique and iconic artifacts to celebrate the place where you live and make the basic needs of walking – memorable! I'd love to flaneur DUMBO, short for “Down Under the Manhattan Bridge Overpass” which has become Brooklyn's most expensive neighborhood, as well as New York City's fourth-richest community overall owing to its large concentration of technology startups, its close proximity to Manhattan and its large number of former industrial buildings that have been converted into spacious luxury residential lofts. 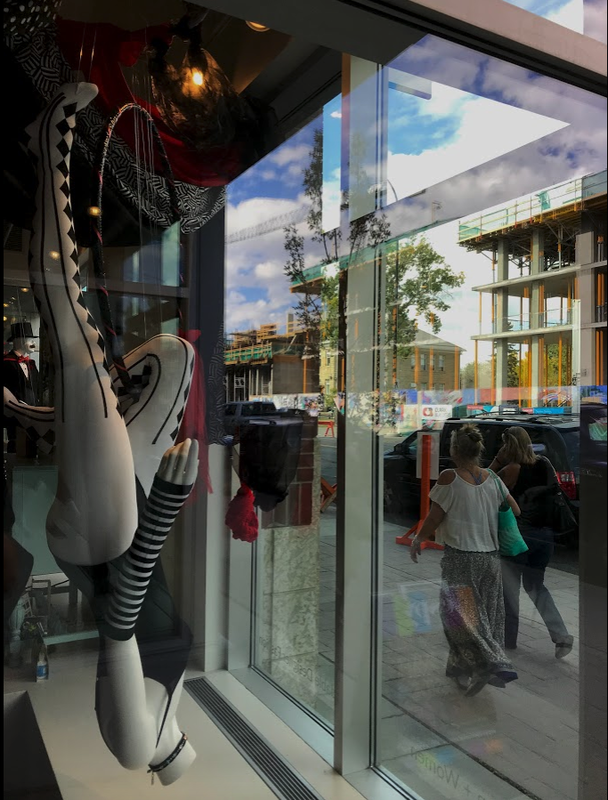 The neighborhood currently serves as the corporate headquarters for e-commerce retailer Etsy, home furnishing store West Elm and Bjarke Ingles Group (BIG) architects who just happen to be the architects of Calgary’s newest signature building Telus Sky. 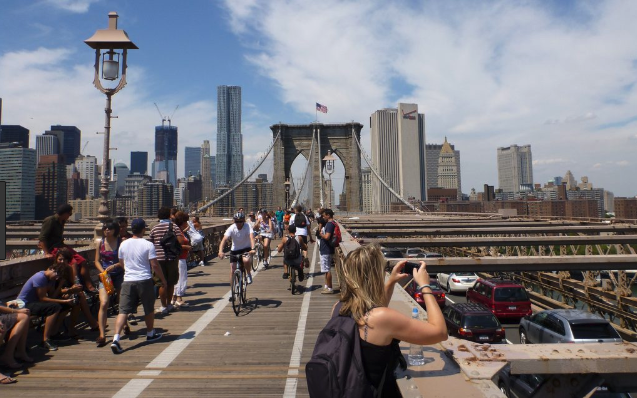 The Brooklyn Bridge is not only an architectural/engineering gem, it is a popular commuter route with 10,000 pedestrians and 3,500 cyclists on weekdays and this total can swell to 30,000+ on weekends in the summer. It is often called the “Times Square In the Sky” because it is such a popular public space like Times Square. It is 1825m long or about 14 times the length of Calgary’s Peace Bridge. This is on my "bucket list." 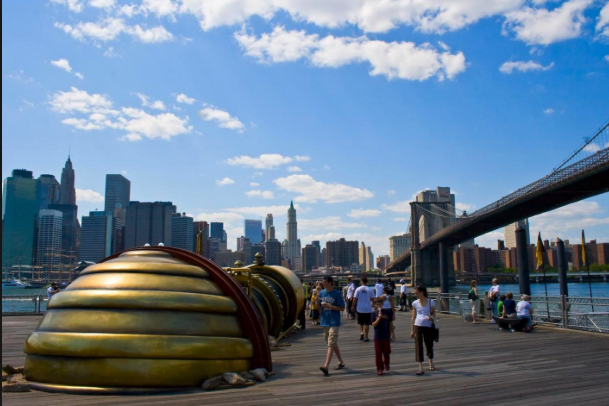 I would also like to check out the Brooklyn Bridge Park to see how it compares to other river parks I have experienced in other cities from Hong Kong to Frankfurt, from Berlin to Calgary. 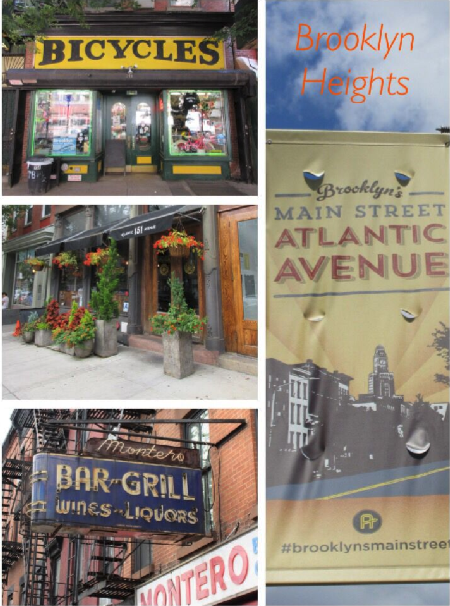 And I love wandering residential urban streets, so Brooklyn Height's brownstones will be at the top of my list. Unlike Tom, when I go to Brooklyn it will be for at least a week, not a day. 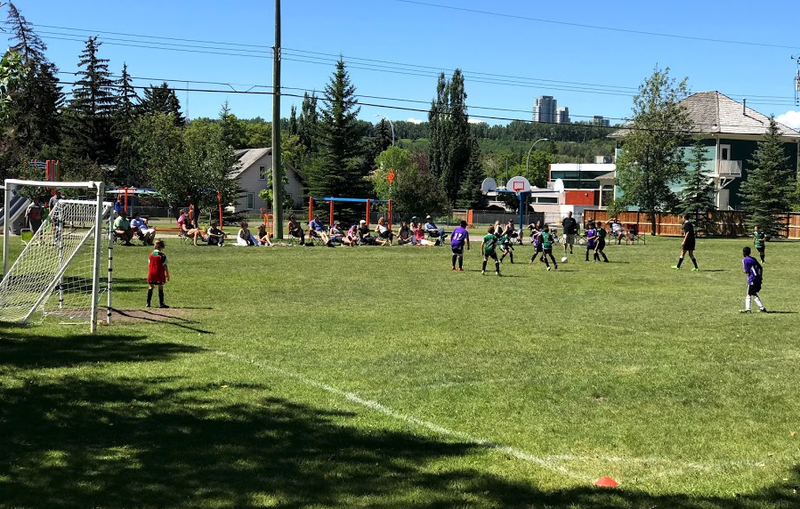 Calgary vs. Edmonton: Who has the best river valley parks? The City of Edmonton's website. 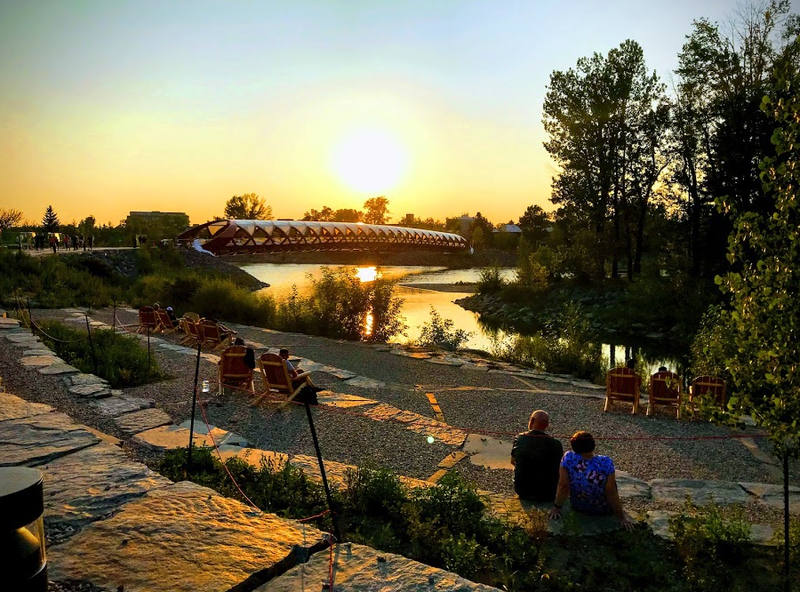 Quick mental calculations made me think Calgary could easily match or exceed that with our three amazing river valleys – Bow, Elbow and Fish Creek. And Calgary easily has over 160 kilometres of river pathways. 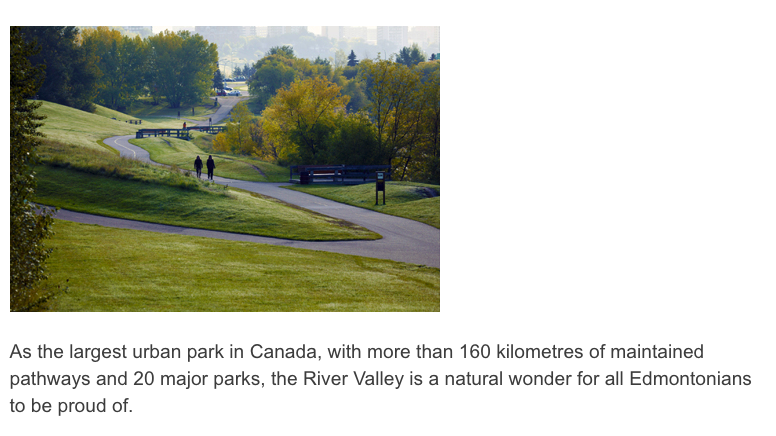 And I immediately started doing the math to see if Calgary’s river valley could beat 20 parks and attractions. 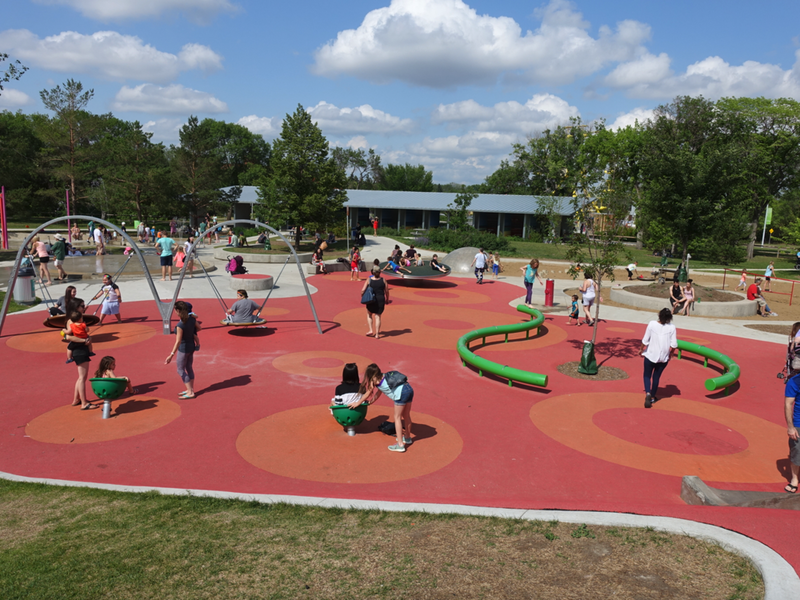 William Hawrelak Park is perhaps Edmonton's signature urban park. Prince's Island is Calgary's signature urban park. Edmonton's North Saskatchwan River Vallery is a place to escape from the city. 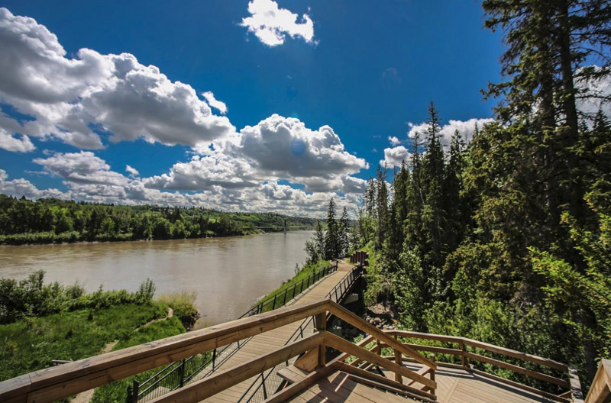 The Douglas Fir Trail is just one of the many places in Calgary's river valley where you can escape the city. And then of course there is the massive, Fish Creek Park that encompasses the entire creek valley within the city’s boundaries. One of the largest urban parks in North America, it stretches 19 km from east to west. At 13.5 square kilometers, it is over three times the size of Vancouver's Stanley Park. S.S. Moyie on Calgary's Glenmore Reservoir. Early morning walk along Calgary's Elbow River. Can you spot the walker? Elbow River Camp at Stampede Park. 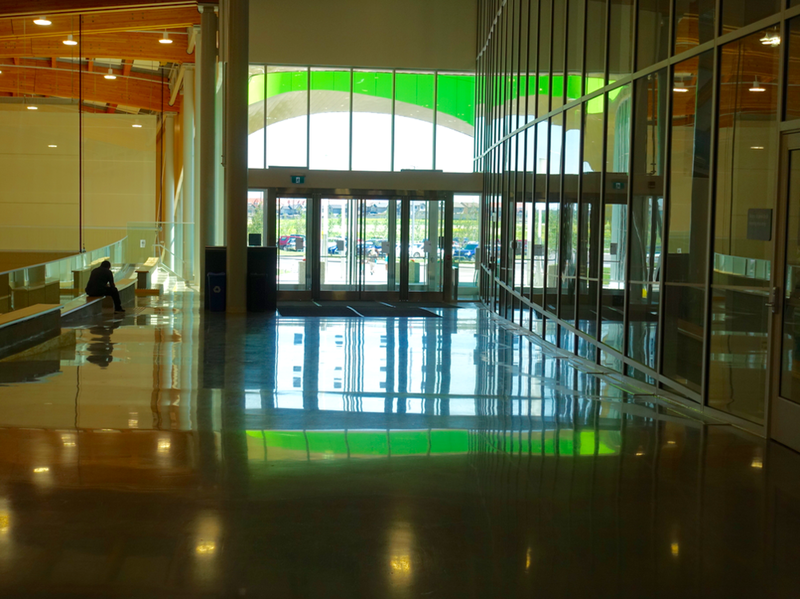 Edmonton’s Kinsmen Centre and Calgary’s Repsol Sport Centre (in Lindsay Park) are probably on par with each other as recreational facilities, but ours is an architectural gem. Calgary can’t match Edmonton’s Convention Centre, but our equivalent would be Stampede Park, which includes the BMO Centre. Edmonton has a baseball diamond in their river valley, Calgary has the Saddledome on the Elbow River. 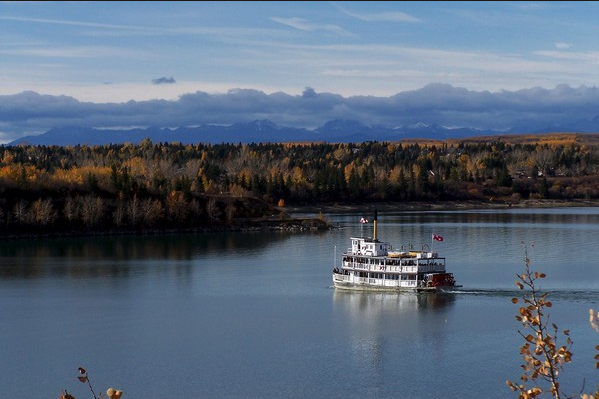 While Edmonton has riverboat cruises, Calgary has the S.S. Moyie paddlewheeler on the Glenmore Reservoir. In addition, Calgary has thousands of floating rafts, kayaks, canoes and paddle boarders something I understand Edmontonians don’t do as much. Oh, and what about river surfing at Louise Bridge and some the best fly-fishing in the world all along the Bow River. What does Edmonton have to match the Calgary Zoo, Fort Calgary, Heritage Park and Shaw Millennium Park? 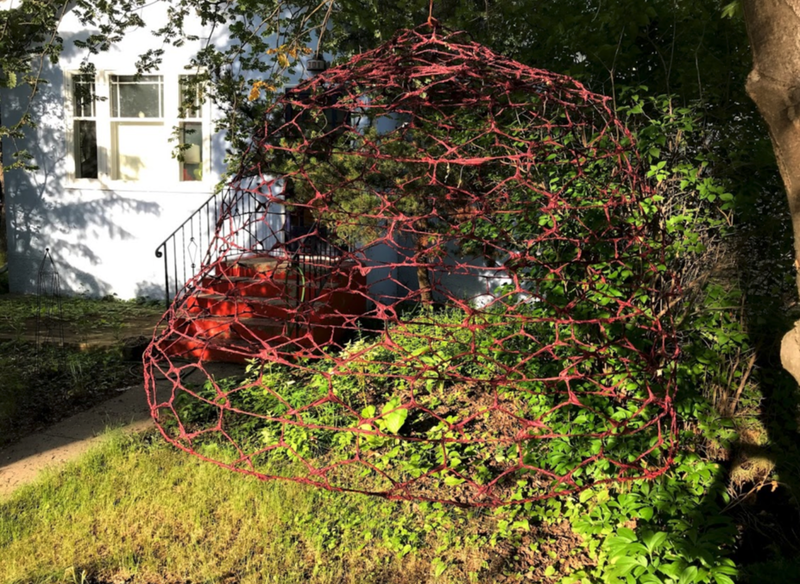 Fort Edmonton for sure and the Muttart Conservatory? Anything else? 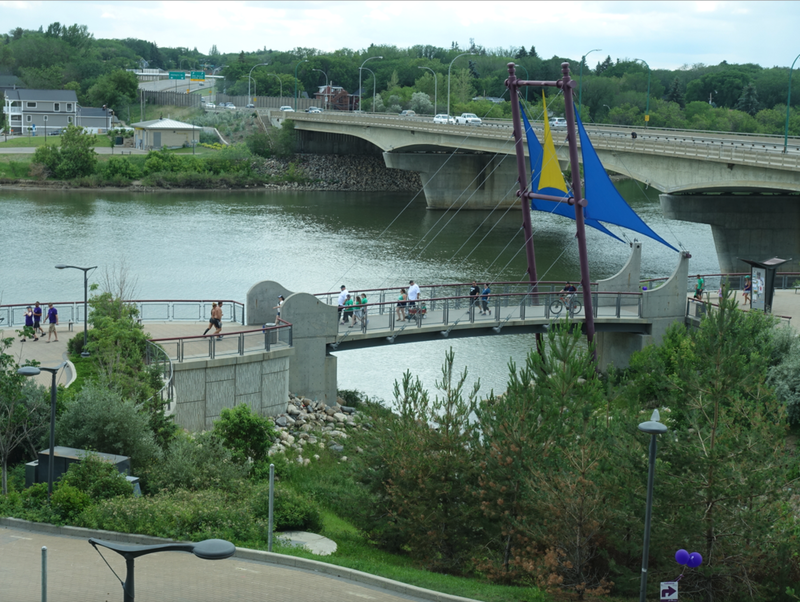 Edmonton has the 100th St funicular (an elevator for small groups of people and bikes) that links downtown with the river valley. Calgary’s river valleys are more accessible so we don’t really need a funicular. 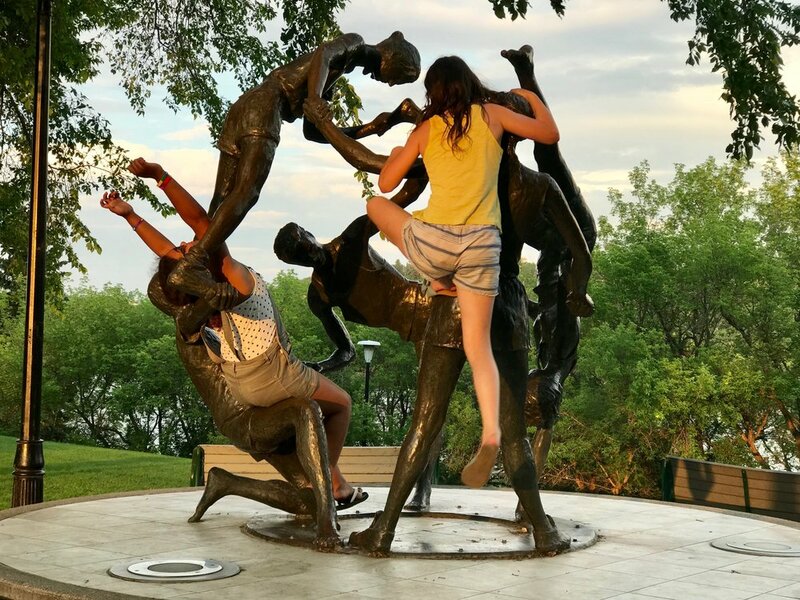 Calgary has the Crescent Heights staircase that we have turned into a unique recreation experience. Edmonton’s Folk Festival in Gallagher Park is definitely more internationally renowned than Calgary’s. But we do have that world’s “Greatest Outdoor Show on Earth” happening at Stampede Park which just happens to be along the Elbow River. What about golf courses within the city limits? Calgary has six: Valley Ridge, Inglewood, Calgary Golf & Country Club, Lakeview, McKenzie Meadows and Blue Devil. 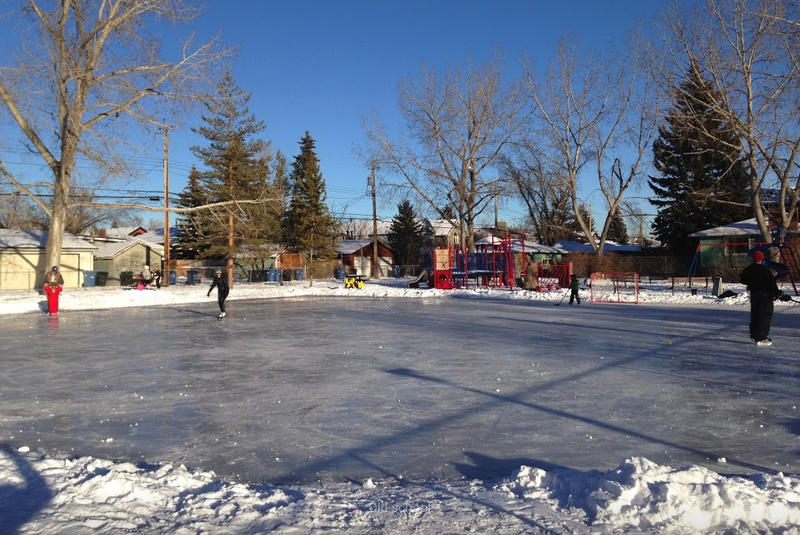 Edmonton also has six: Windermere, Royal Mayfair, Victoria, Riverside, Rundle Park and Raven Crest. 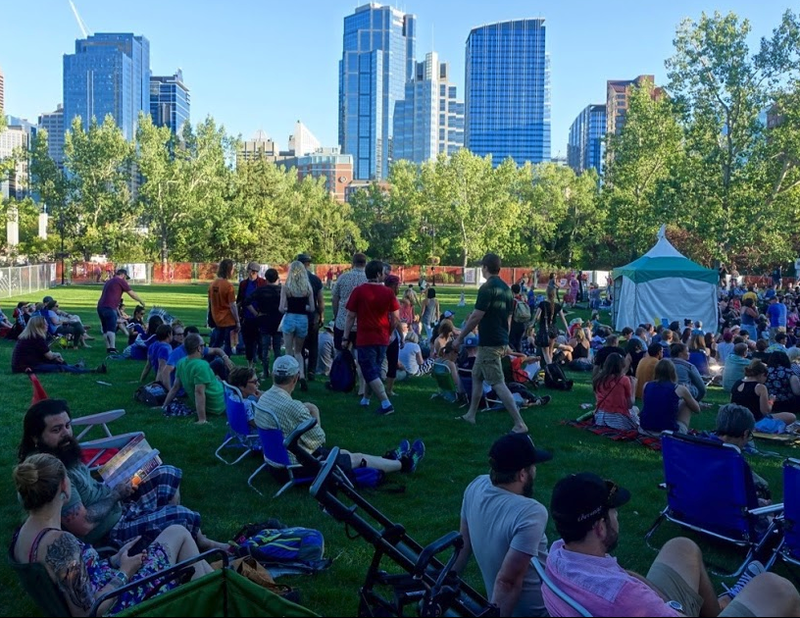 Calgary's International Folk Festival's home is Prince's Island which is located on the edge of downtown in the middle of the Bow River. 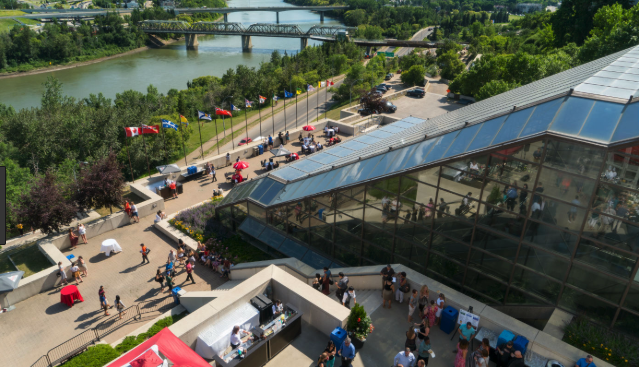 Edmonton's Shaw Conference Centre is built into the bank of the North Saskatchewan River. Muttart Conservatory is one of Edmonton's architectural gems. 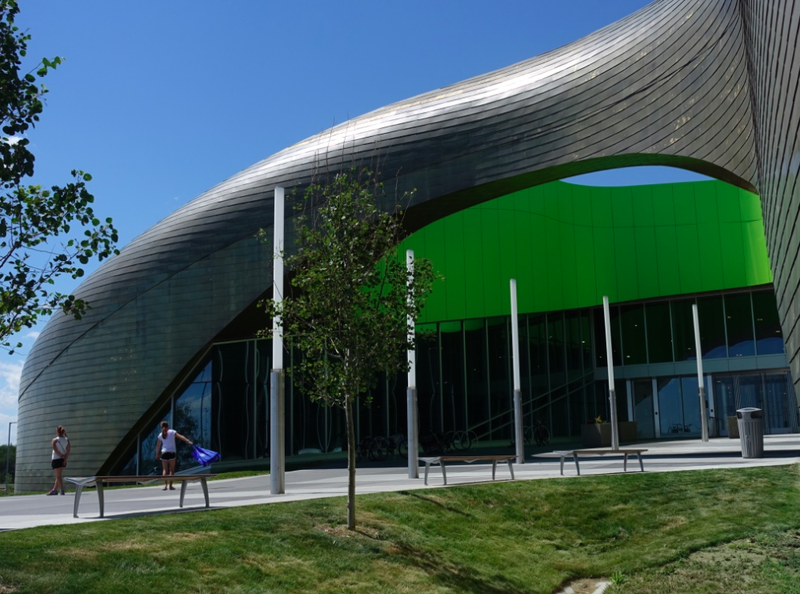 Repsol Sport Centre is one of Calgary's architectural gems. Edmonton's High Level Bridge at night. Calgary's Reconciliation Bridge at night. 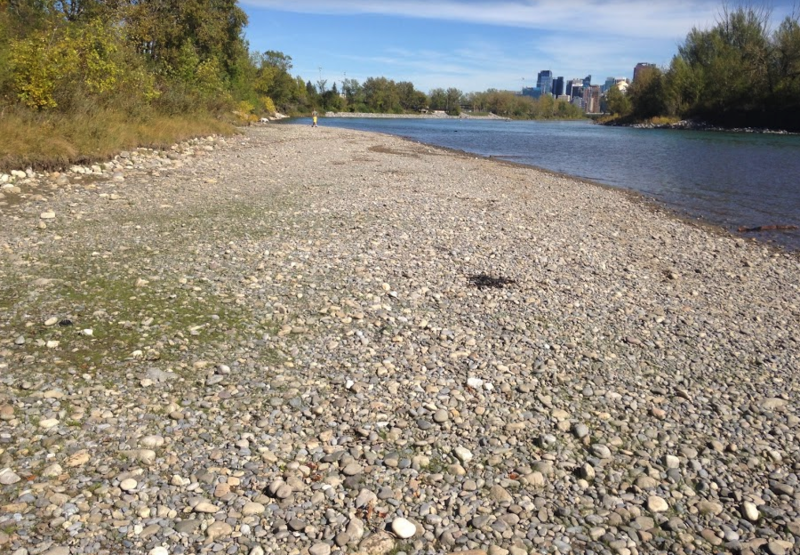 Does Edmonton have the numerous natural pebble beaches along their river valley that Calgary has? 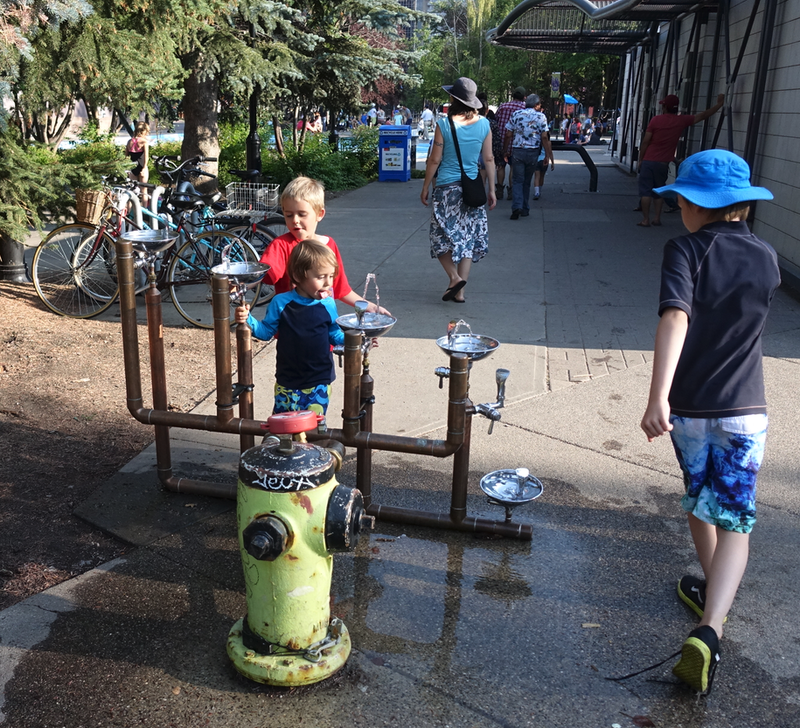 What about urban promenades like Calgary’s Eau Claire or East Village? Can Edmonton match these urban gems? Can Edmonton’s downtown workers easily walk to the river and back at lunch hour? Can Edmonton match Calgary’s iconic river bridges – Centre Street, Peace Bridge and George King Bridge? Yes, Edmonton has the High Level Bridge. Can Edmonton match Calgary’s Elbow River Camp (formerly Indian Village) at Stampede Park? What about a theatre space like Calgary's Pumphouse Theatre? What about river island parks? Does Edmonton have anything to match Prince’s, St. Patrick and St. George’s islands? The green beach in Calgary's Stanley Park. The pebble beach in downtown Calgary's St. Patrick's Park is a popular family spot. 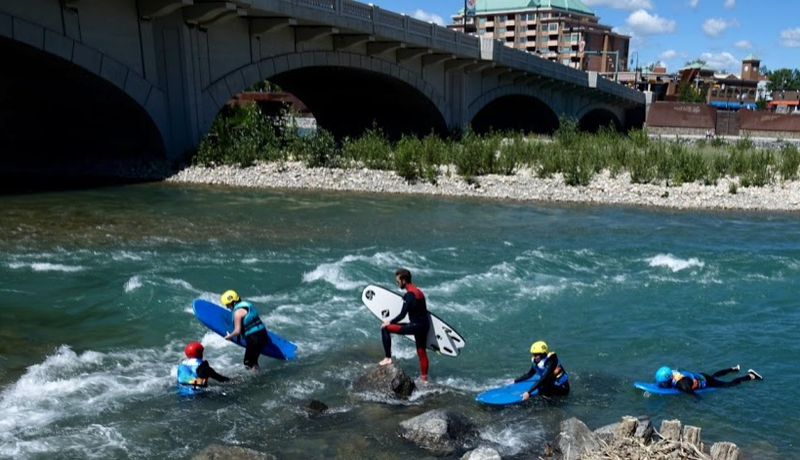 River surfing has also become a popular activity in downtown Calgary. I decided to send my unscientific analysis to a couple of friends who live in Edmonton but have lived in Calgary to see if I was being fair. Both were adamant I wasn’t. 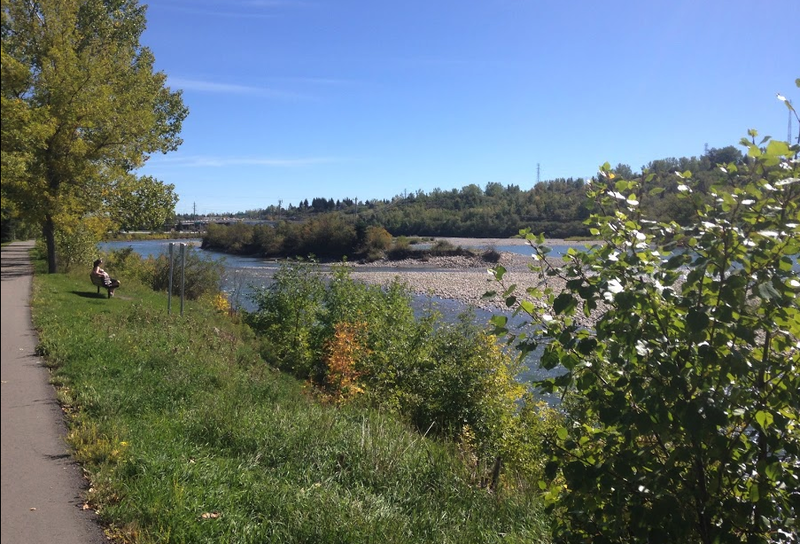 “Calgary has a great river valley, but Edmonton's river valley is spectacular. Comparing the two river valleys against one another is not an apples to apples thing. The two cannot be compared and "winner" identified. The two valleys are completely different, not only in their geography, but how each river valley relates to and is integral to the respective city. 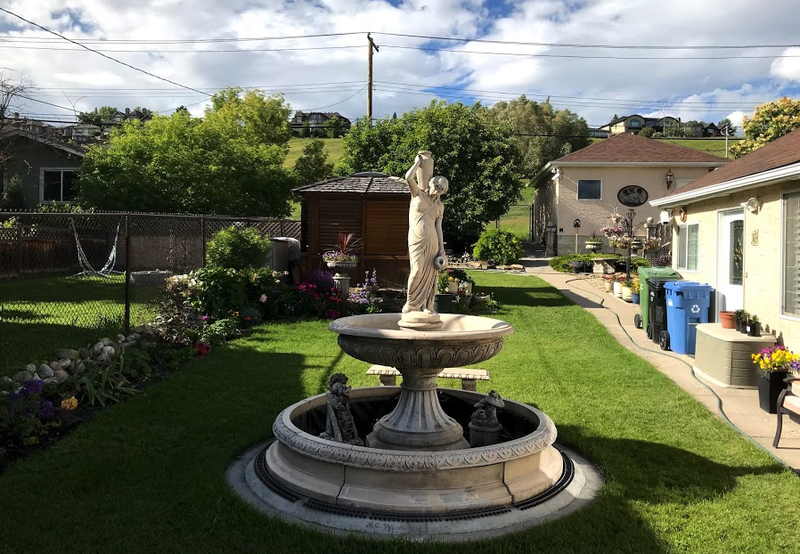 Edmonton's river valley is a sharp, well defined river escarpment running through the heart of the city with very little commercial or residential development. Calgary's river valleys are much more tapered. The entire downtown and beyond is built at the bottom of the escarpment, right on the river flood plain. You don't even climb out of the south side of the Bow River Valley until you climb up to the green on the first hole of the Calgary Golf and Country Club. Calgary's river valley is integrated into the rhythm and flow of the urban downtown experience because the downtown is in the river valley. 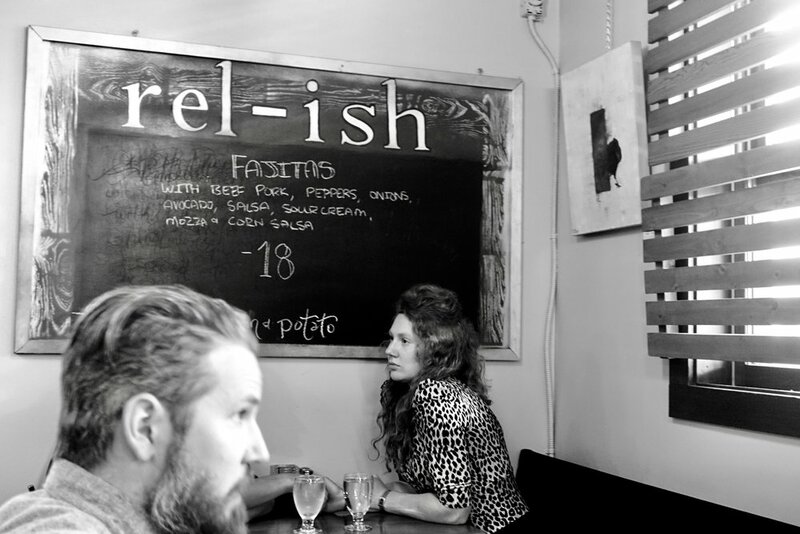 While Edmonton's river valley is more an escape from the city right in the heart of the city. Being a veteran of 60 marathons and a dozen ultra-marathons, I have logged a lot of miles in both river valleys. I have run literally thousands of kilometers in Calgary and Edmonton along the rivers and I have to concede that Edmonton's river path system is second to none. You can literally run for hours and not even be aware there is a city all around you. 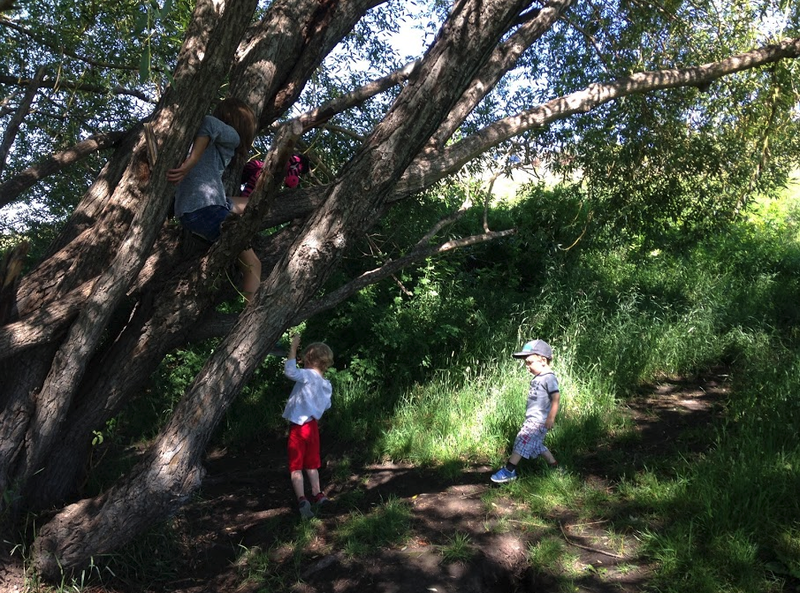 Edmonton's River Valley is a near continuous, uninterrupted park experience. Not so with Calgary's trails. There are constant reminders of the city confronting you all along the trail, from Fish Creek Park all the way to Bowness Park. Calgary's river valley is urban by necessity and design." Ice Castles in Edmonton's Hawrelak Park. Terry continues, "Both work for both cities. But, if I had my choice, the escape from the city is preferred. In your analysis you kind of skimp on the other pluses of the Edmonton River Valley. The Muttart Conservatory, three river valley ski hills inside city limits, the sandy beaches that pop up every summer to enjoy, The Edmonton Zoo (granted, it can't hold a candle to the Calgary Zoo, but for a day's outing with a young family, still very rewarding), the Equestrian Centre just down the road from Fort Edmonton, where you can go horseback riding along the river, mountain bike trails (also great for ultra-marathon training), canoeing and the many, many parks offer everything you can think of. So, in my mind, both river valleys really reflect the cities and both work for both cities. Neither wins. To say one is better than the other is like saying golf is better than baseball. To each his/her own. Edmonton's spectacular new funicular and stairs is a lovely urban public space. Roof top patio in Calgary's East Village offers great views of the Bow River. Likewise, Calgary's new West Eau Claire park with the Peace Bridge is a great place to sit. Calgary's massive East Village redevelopment next to the Bow River. Fair enough! One can never say something is the “best” as it really depends on each individual’s perspective and interests. While my friends love how Edmonton’s river valley is an escape from the city, I love to embrace the urban experience. Perhaps the Canadian thing to do is say both Calgary and Edmonton have great river valley experiences, Calgary’s being more urban while Edmonton’s is more natural. Shane Homes Rocky Ridge YMCA Gone Wild? I promised myself that this summer I would be a tourist in my own city and explore beyond Calgary’s City Centre. Having heard great things about the new recreation centre in Rocky Ridge and seeing the amazing computer rendering I decide to check it out one day after golf. It is literally at the edge of the City. And it didn't disappoint! It is nestled into the base of a hill, looking like some strange spaceship has landed or a slithering alien creature is about to invade the city. 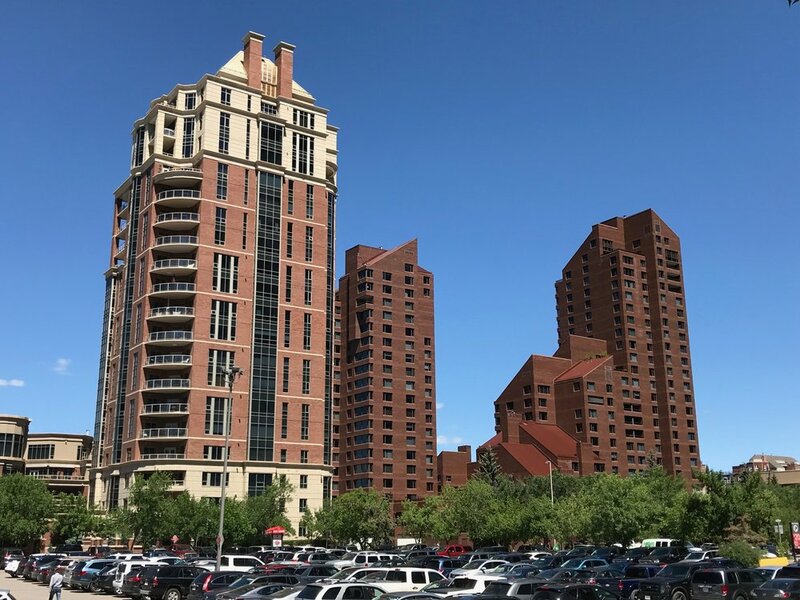 Its curvaceous shape and rich bronze façade is in sharp contrast to the cheap big box stores facades and the hard edges of the houses, condos and other buildings in the surrounding communities. Move over National Music Centre and the new Central Library there is a new kid in town when it comes to iconic public building architecture. And it was designed by Calgary’s own GEC architects, not by some international firm. FYI: GEC also designed the Saddledome one of Calgary other iconic buildings. 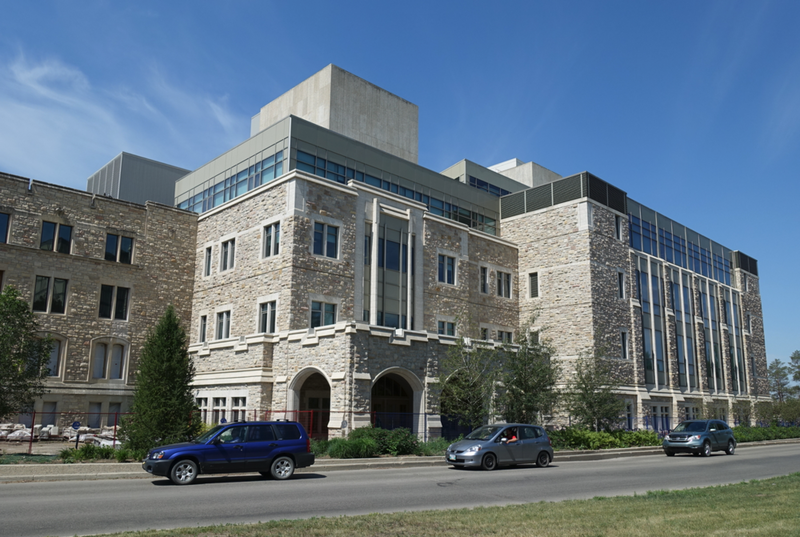 The 284,000 square foot building opened in January 2018 at a cost of $192 million. 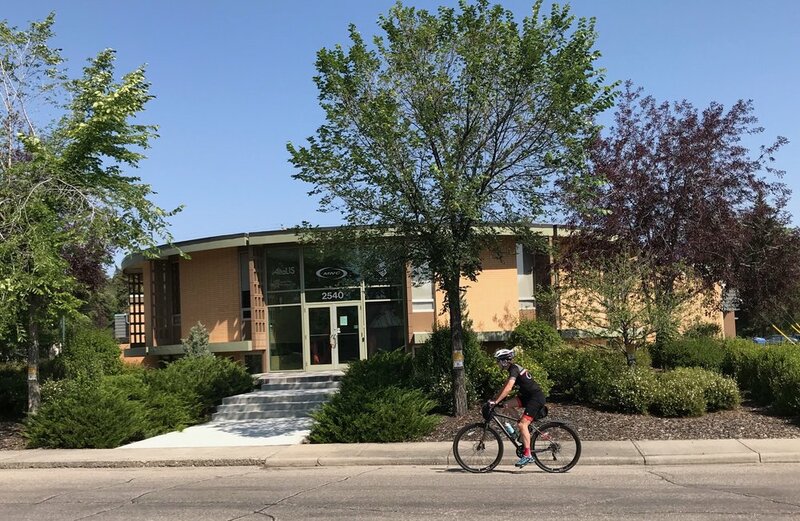 The City of Calgary paid for the building and the YMCA is the operator. Shane Homes paid $3.5 million for naming rights. It is designed to server the 150,000 people living in the new communities at the northwest edge of the city. It is the largest Y in the world, at least for the rest of this year. The new 333,000 square foot SETON Y is scheduled to open in January 2019. Flock by Team of Haddad/Design is one of two public artworks planned for the site. Calgary's new central library is the white building on the left. The pool gets so busy some days they have to turn people away. This is the library which was unmanned when I was there? Interesting open concept and honour system? 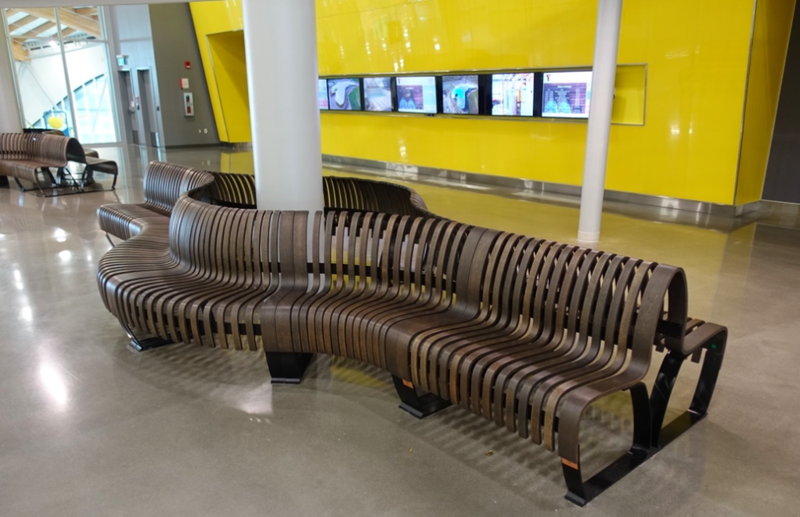 I love how these benches echo the colour and shape of the exterior. Calgary’s love their recreational activities. Shane Homes YMCA @ Rocky Ridge sold 9,700 memberships in its first two weeks. I was there at about 3 pm on a Wednesday in the middle of Stampede and the place was busy. I can only imagine how busy it will be in the winter, when there are fewer outdoor options. This new YCWA is one of four new recreation centers built by the City of Calgary over the past few years, the others being Great Plans (designed by the Calgary’s MTA architecture and Toronto's MJMA), Remington YMCA @ Quarry Park (also designed by GEC) and the futuristic looking SETON YMCA (designed by Calgary’s Gibbs Gage architecture). 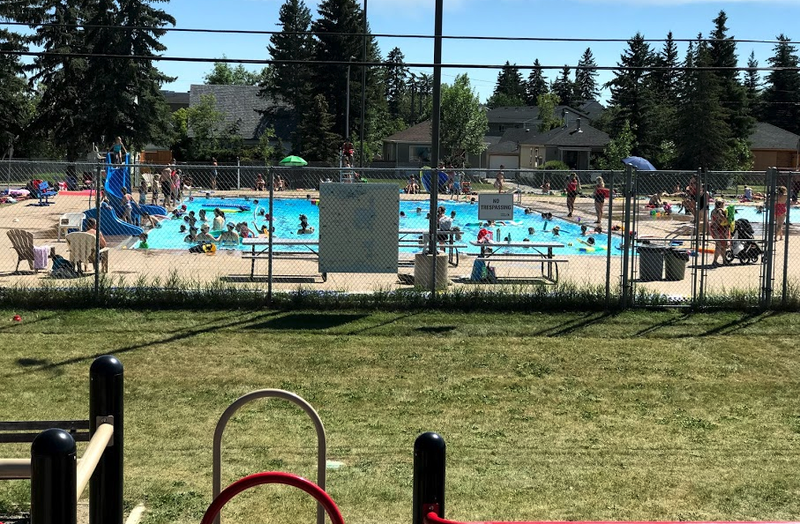 The total cost of all four recreation centres totalled $480 million. And, yes each came with a public art project, which could be the subject of a future blog. 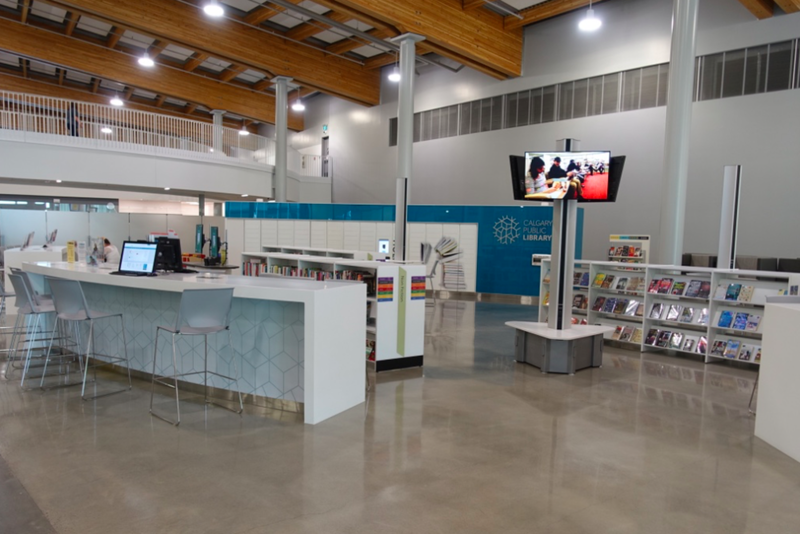 While Calgarians living in the City Centre are getting a signature library and museum, the suburbs are getting signature recreation centres. All with iconic architecture, no cookie cutter boxes anymore. At $675 per square foot, some say it is easy to create an iconic building, the challenge should be to create great architecture with a more modest building. This too could be the subject of a future blog. Stay tuned!